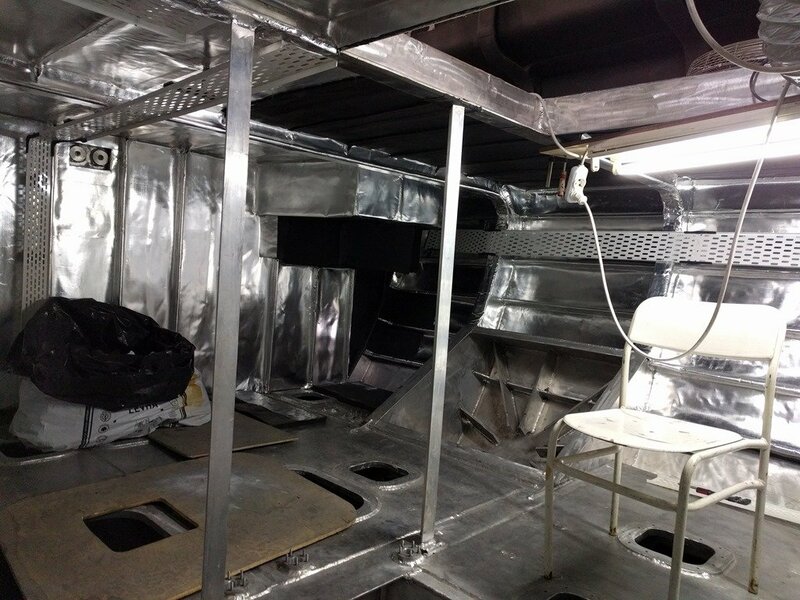 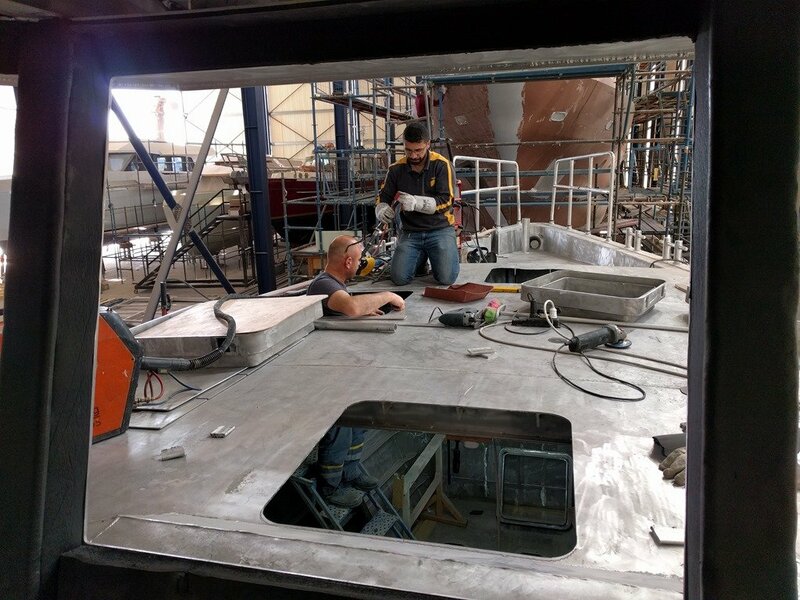 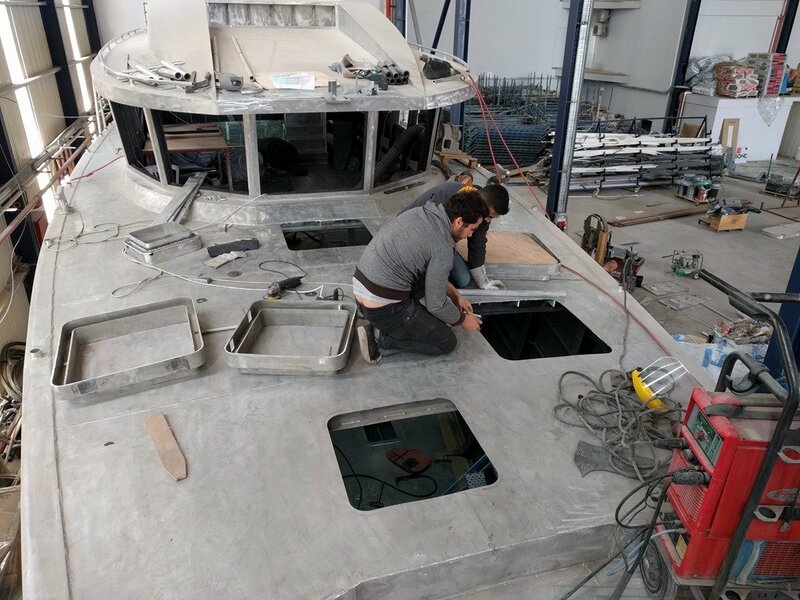 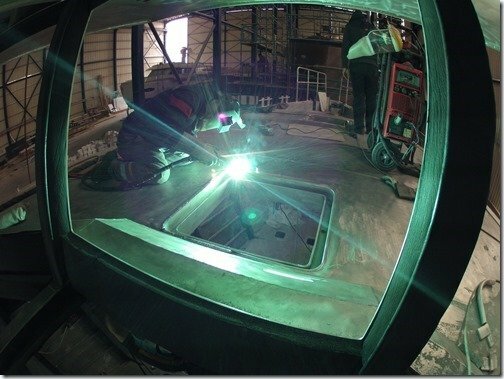 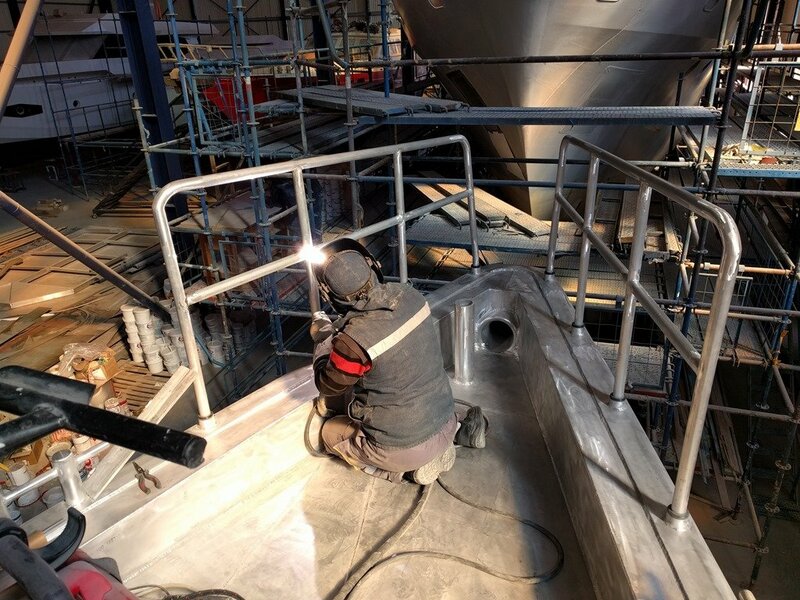 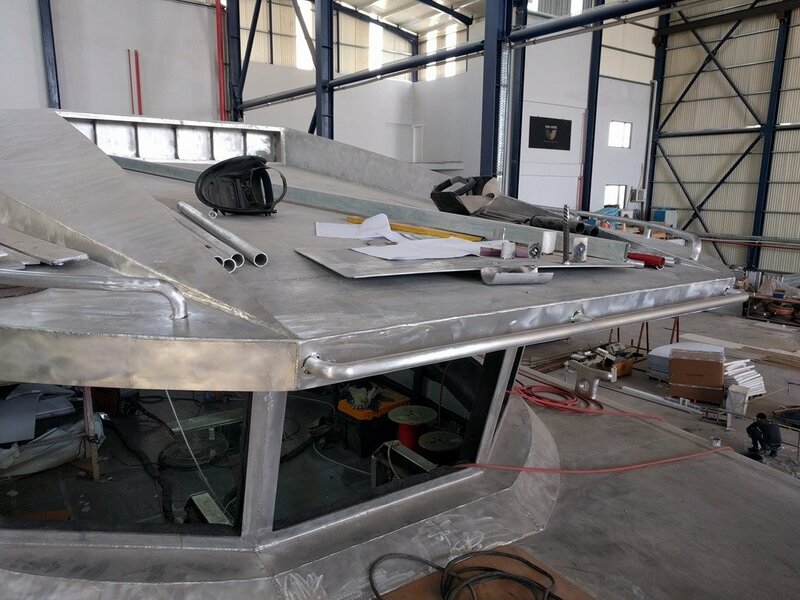 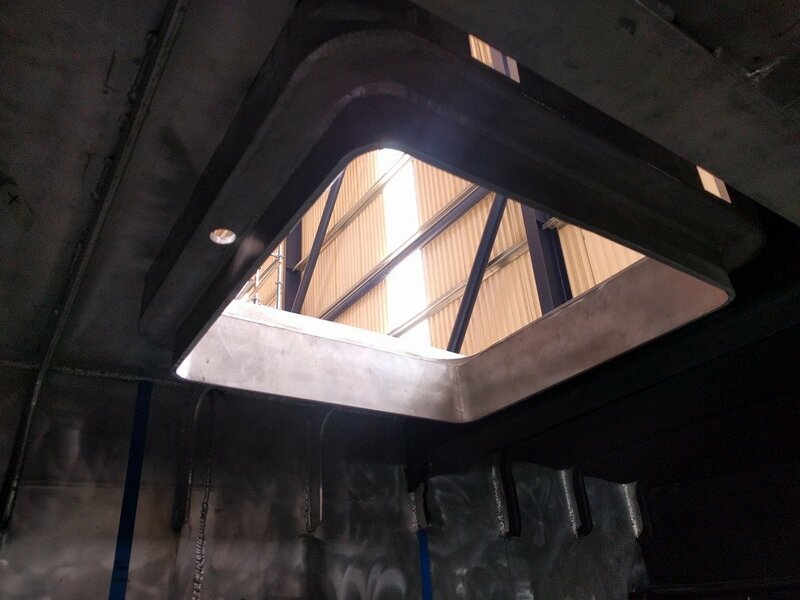 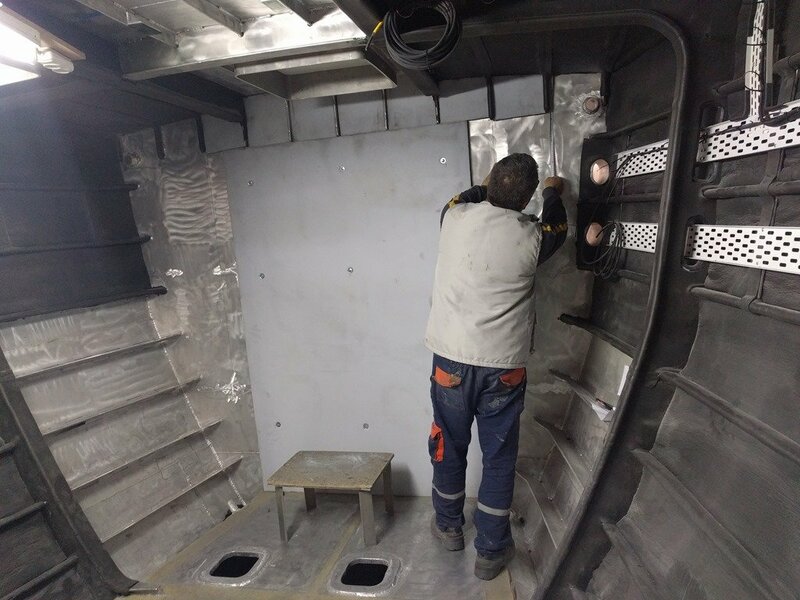 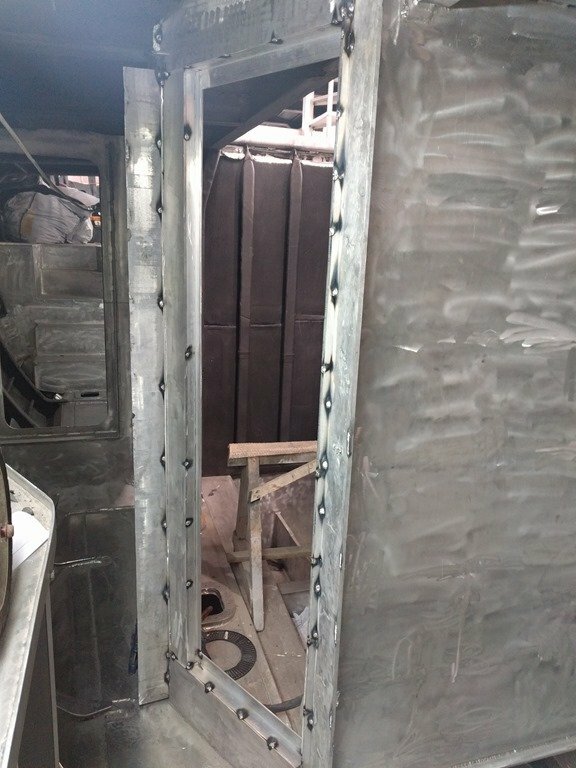 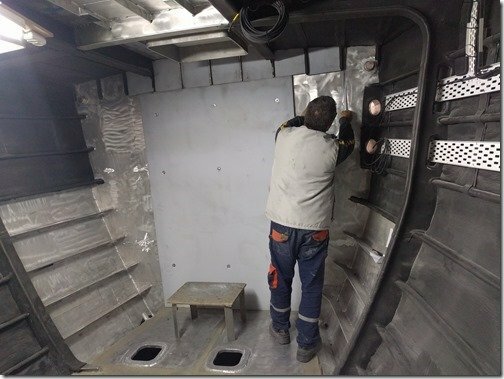 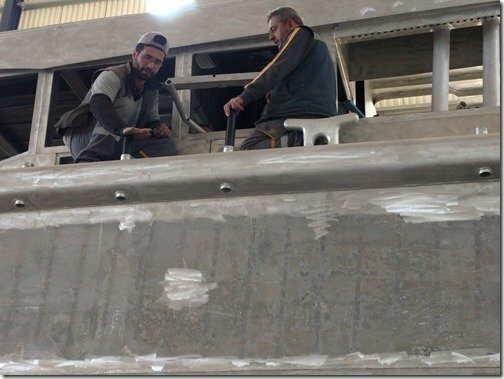 Not as much visible progress this week as most of the work is on finishing previously started projects and behind the scenes work designing hatches and working on the interior designs. 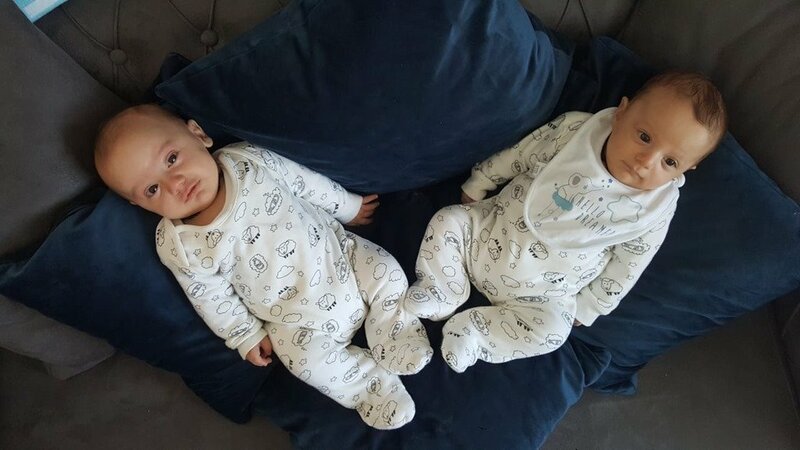 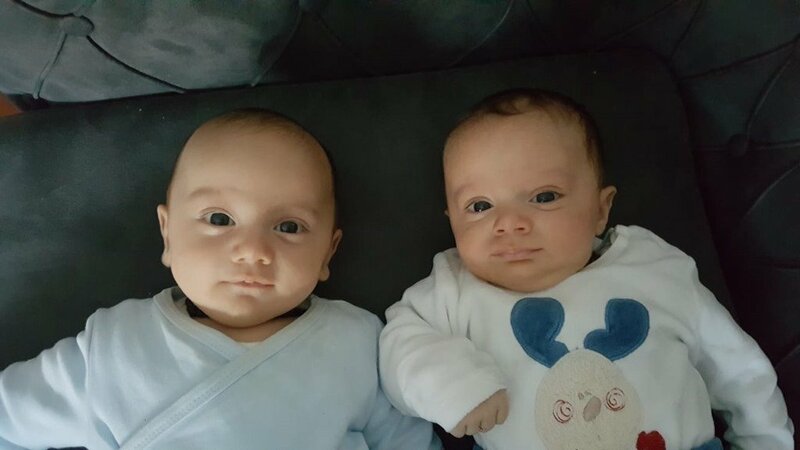 But hope you’ll enjoy the shorter than usual post all the same and let’s dive right in. 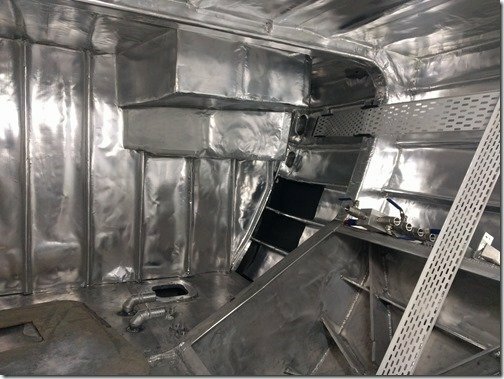 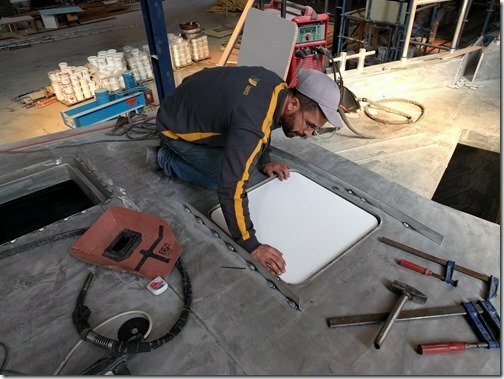 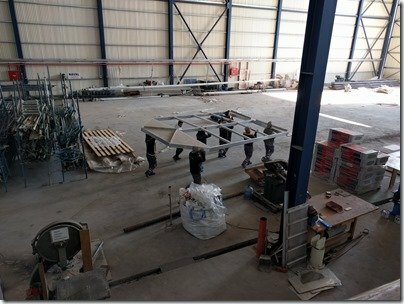 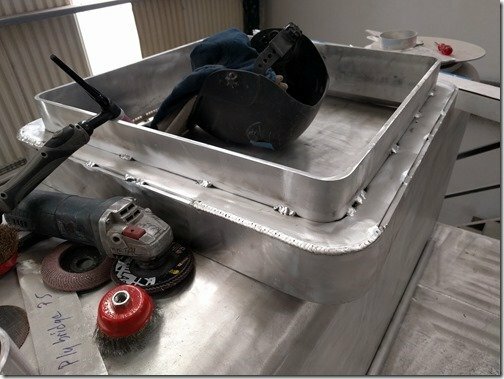 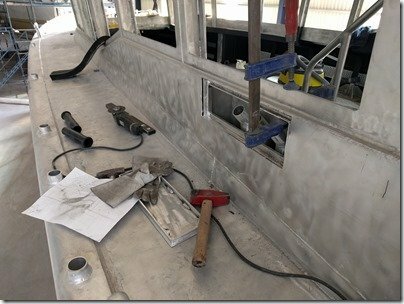 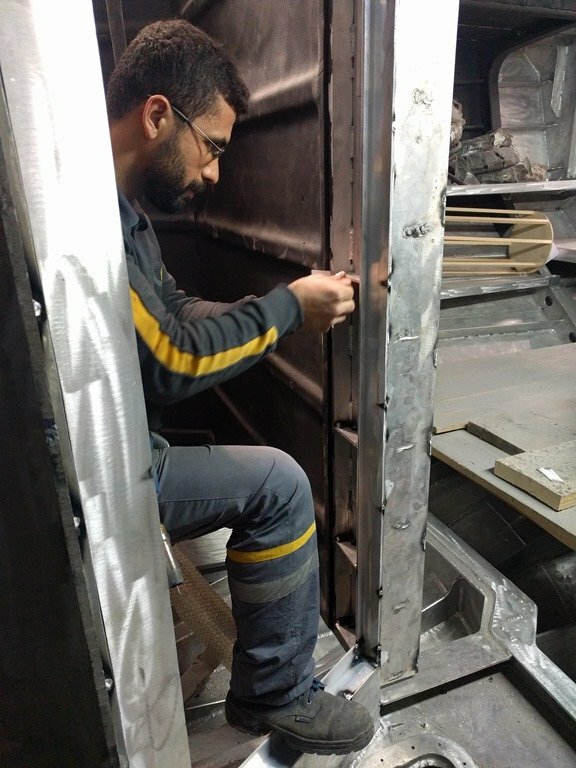 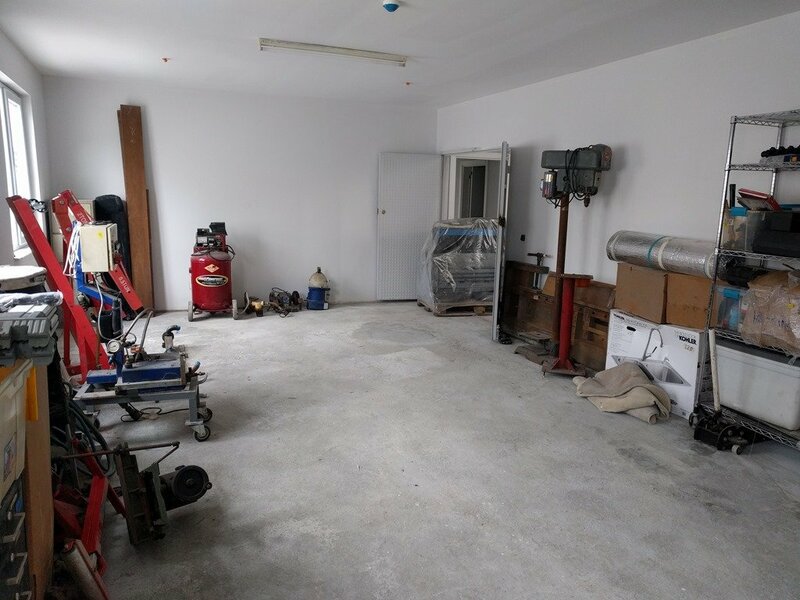 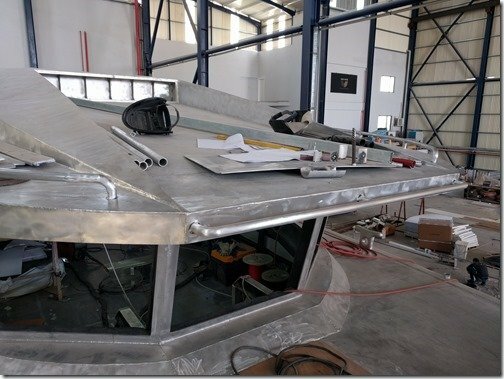 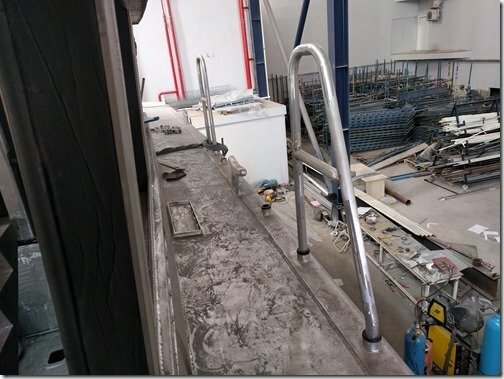 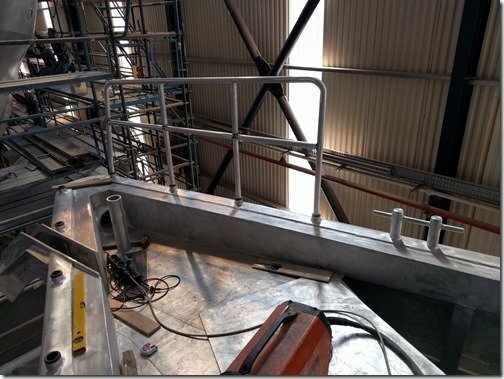 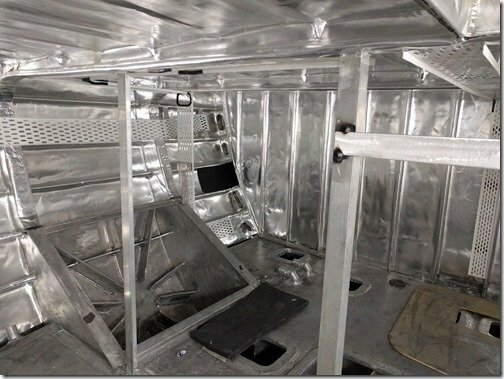 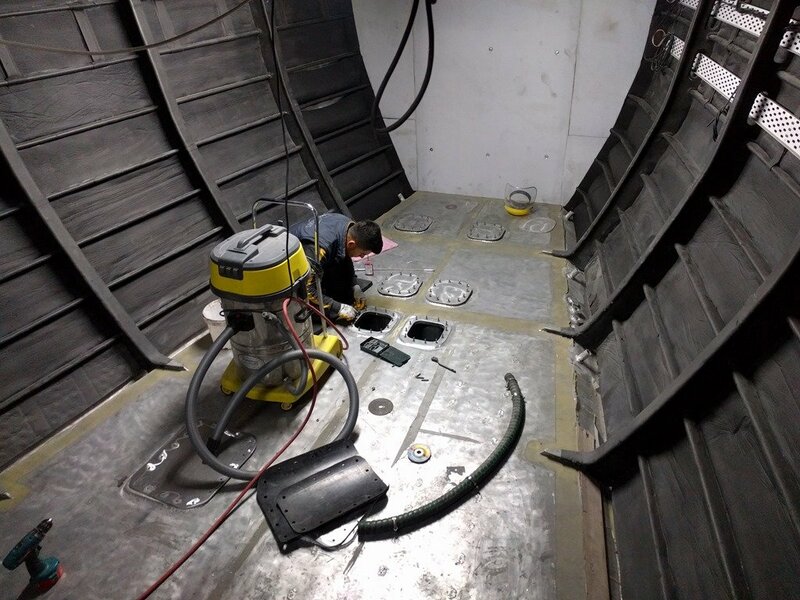 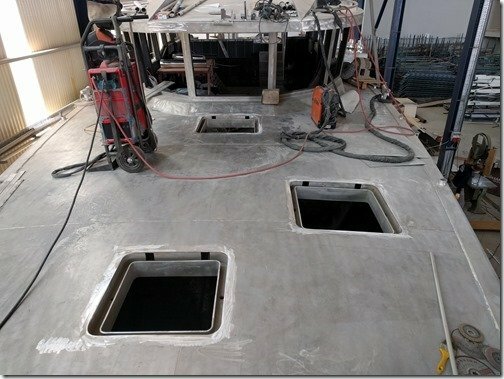 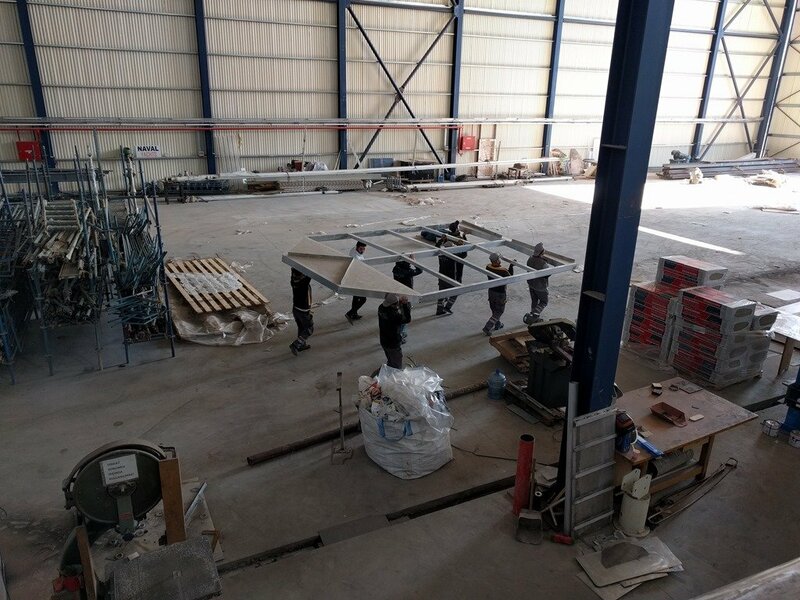 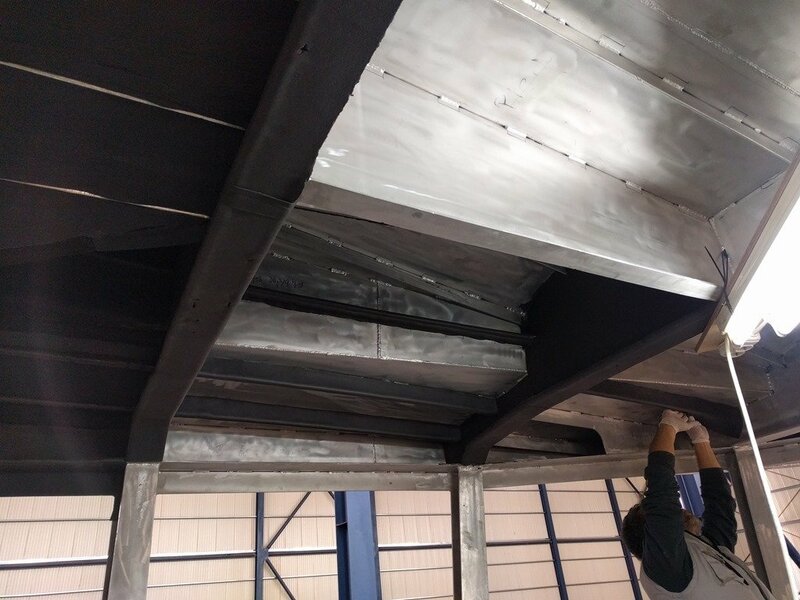 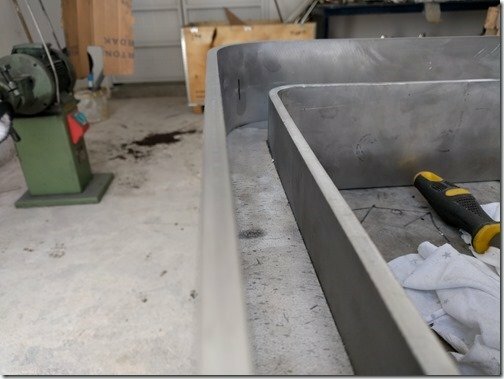 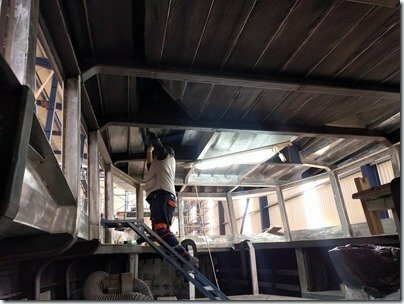 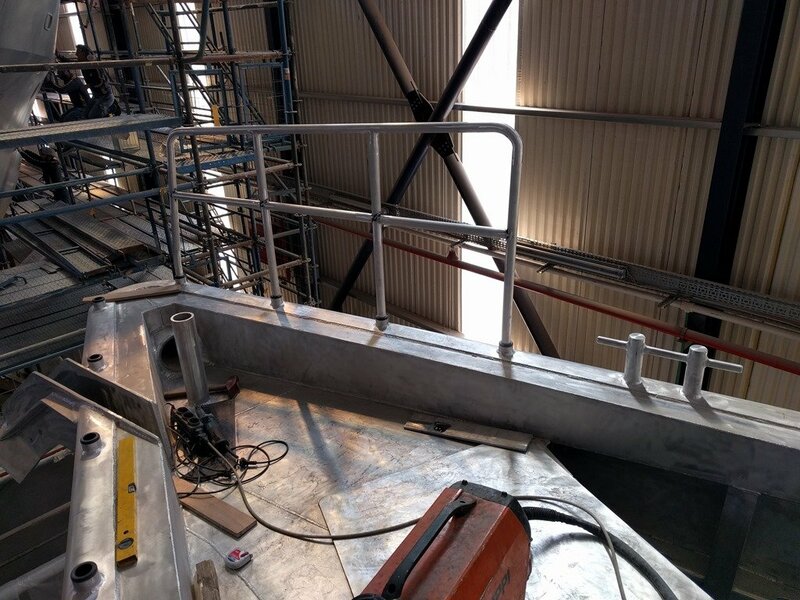 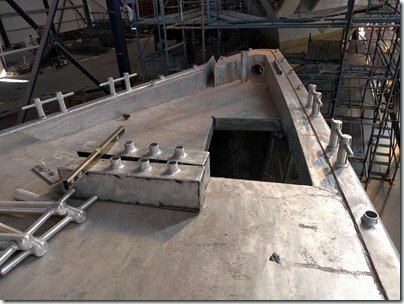 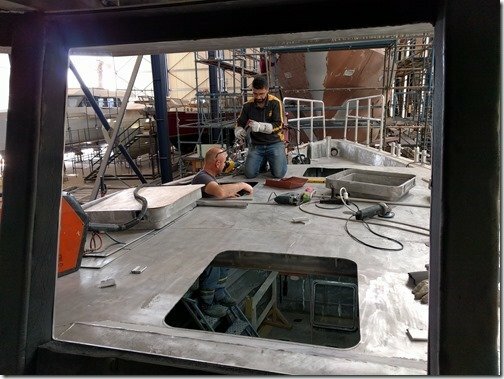 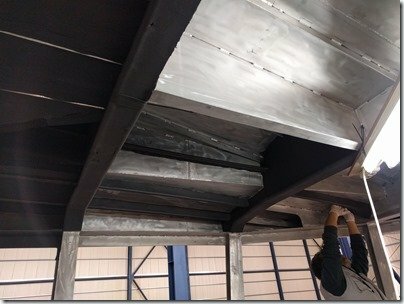 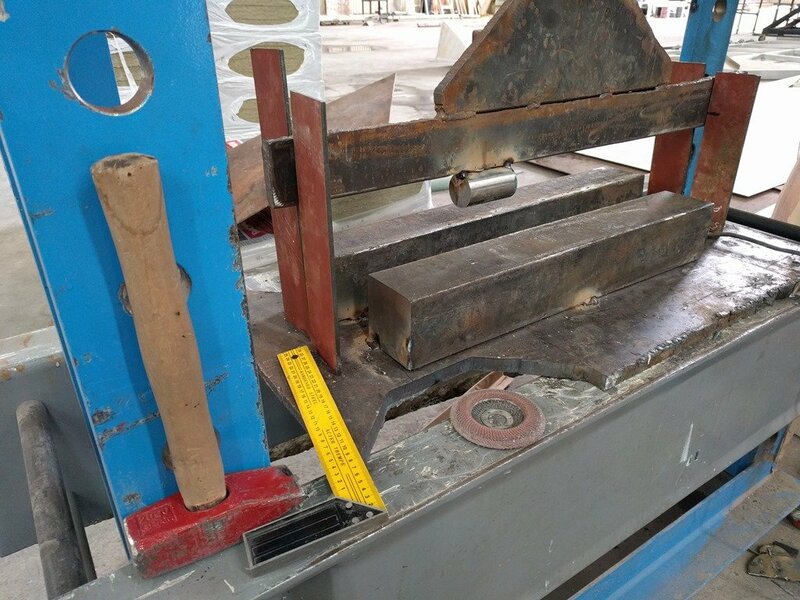 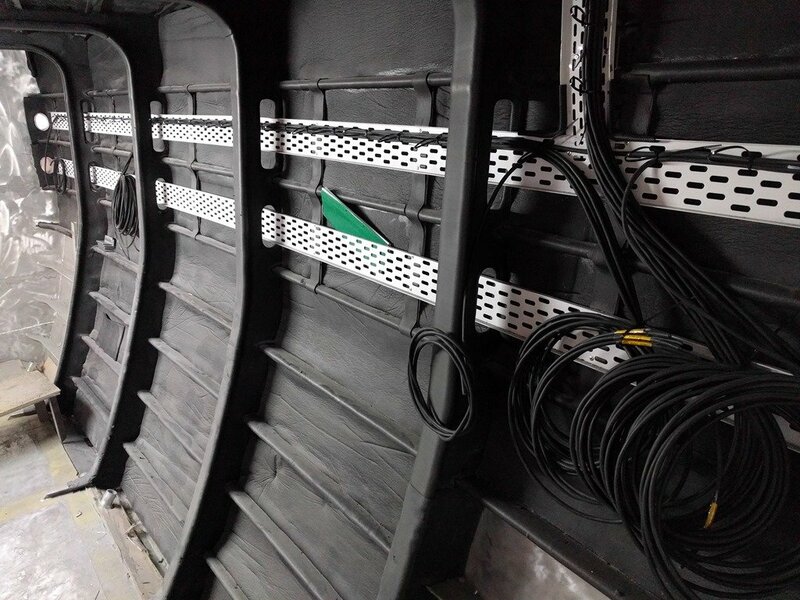 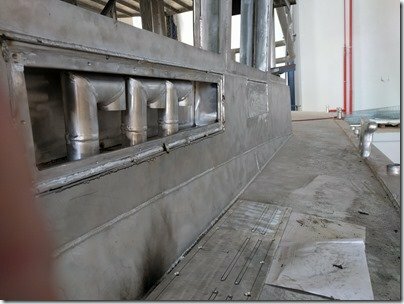 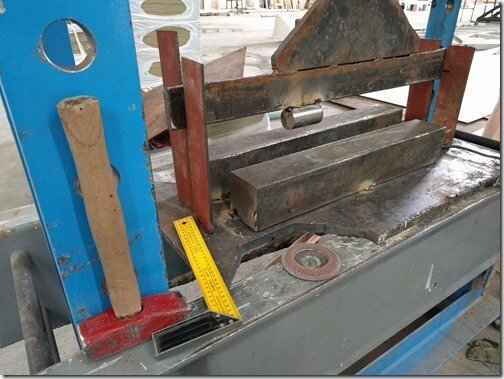 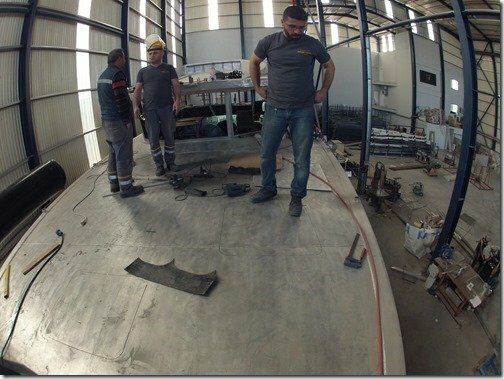 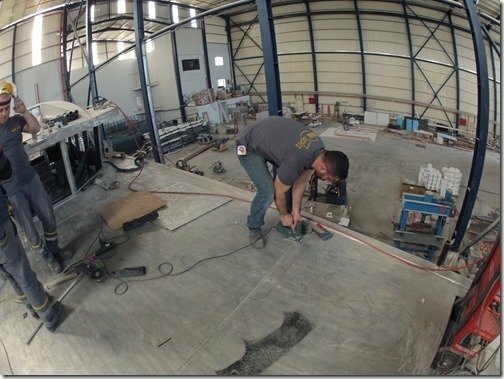 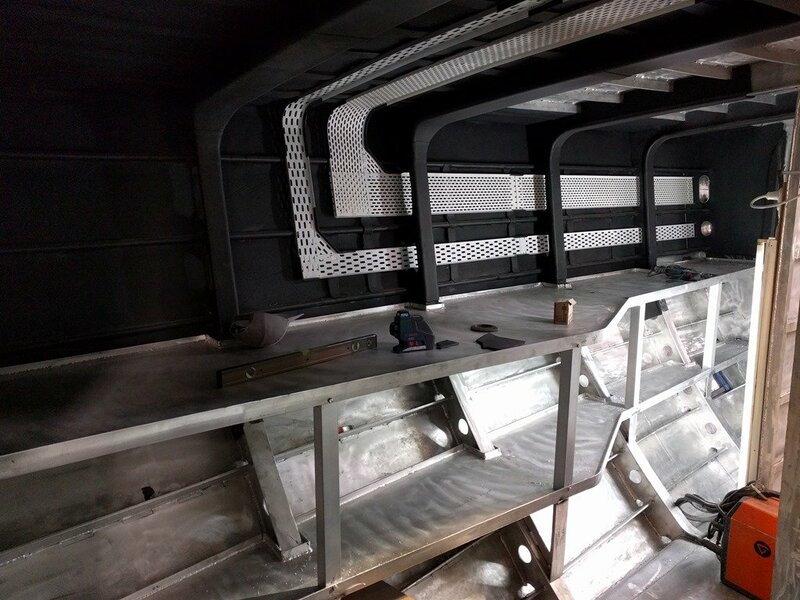 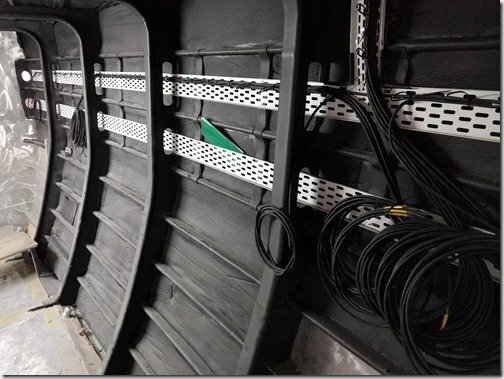 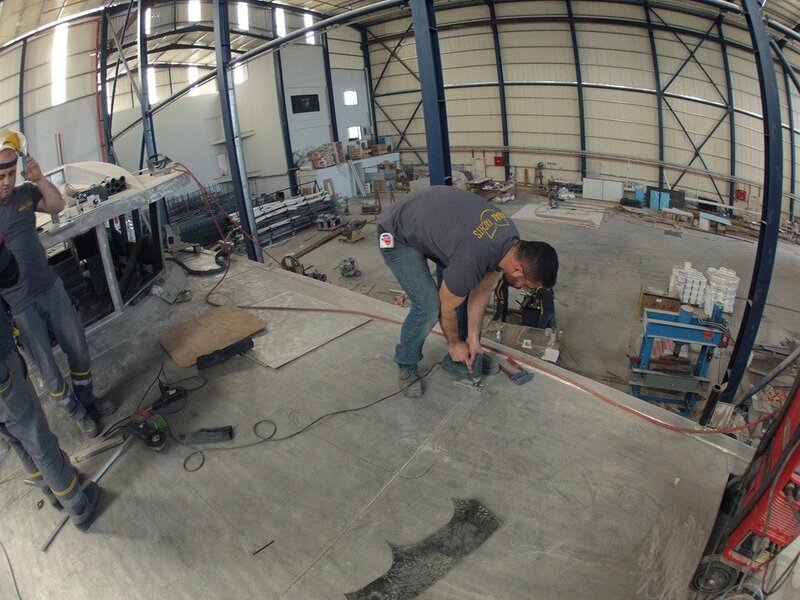 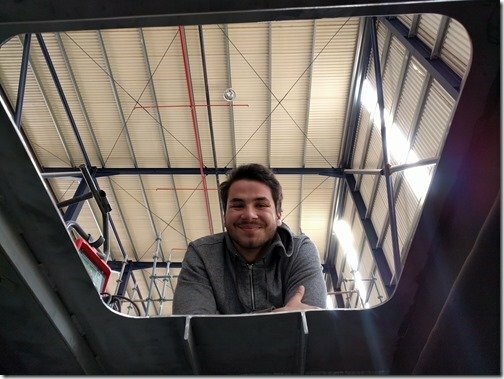 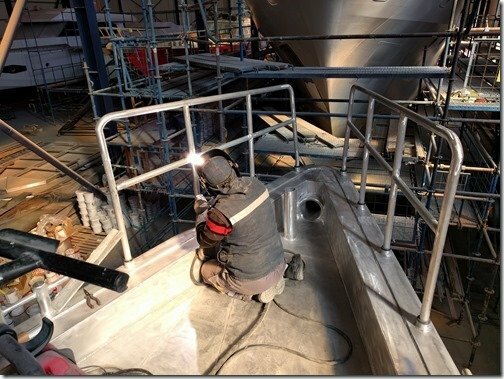 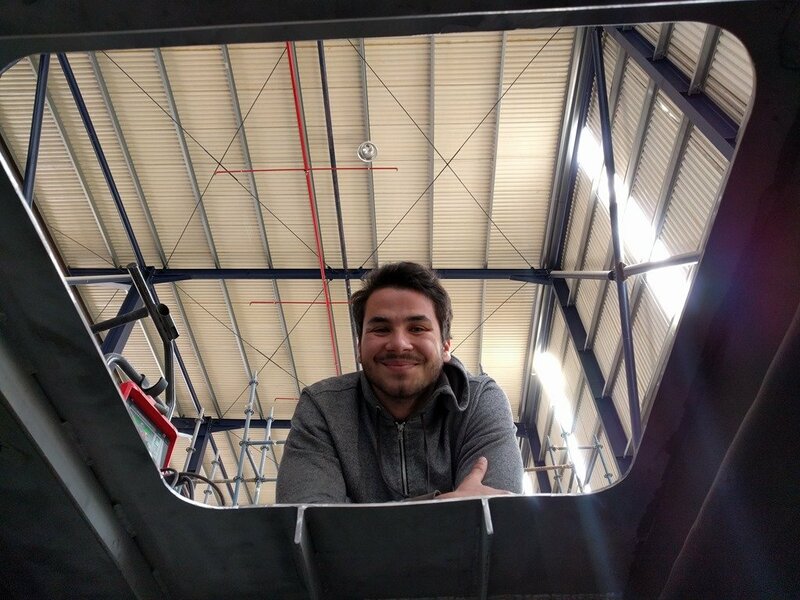 The workbenches and matching lower shelves which run the full length of both sides of the hull in the spacious Workshop are now pretty much complete with all their brackets and braces fully bolted in place. This is the workbench on the Port/Left side looking forward from the aft of the workshop. This is the Starboard side workbench and shelf looking forward along the side of the Engine Enclosure wall. 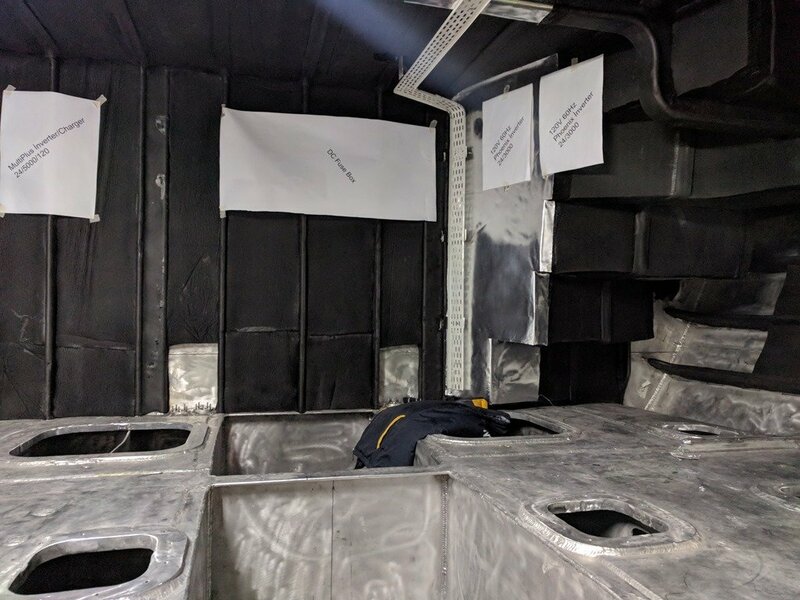 The Day Tank will soon be mounted on the WT bulkhead you see at the far end of this picture and the workbench and shelf will provide the mounting surfaces for things like our Alfa Laval centrifuge, fuel filters and manifolds, watermaker, Kabola boiler, calorifier and others so this area will quickly fill up once we get all that mounted. 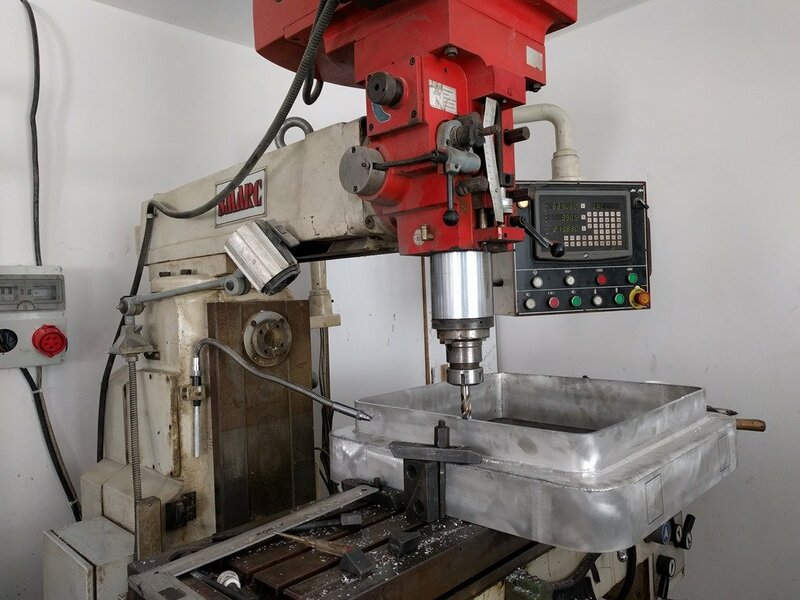 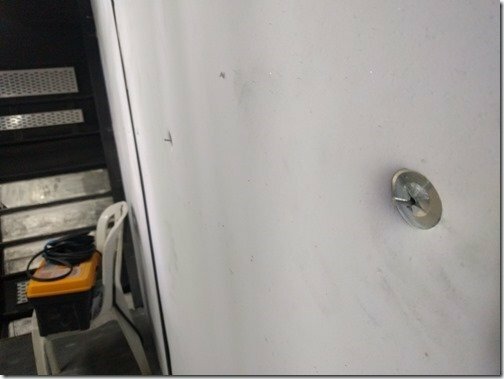 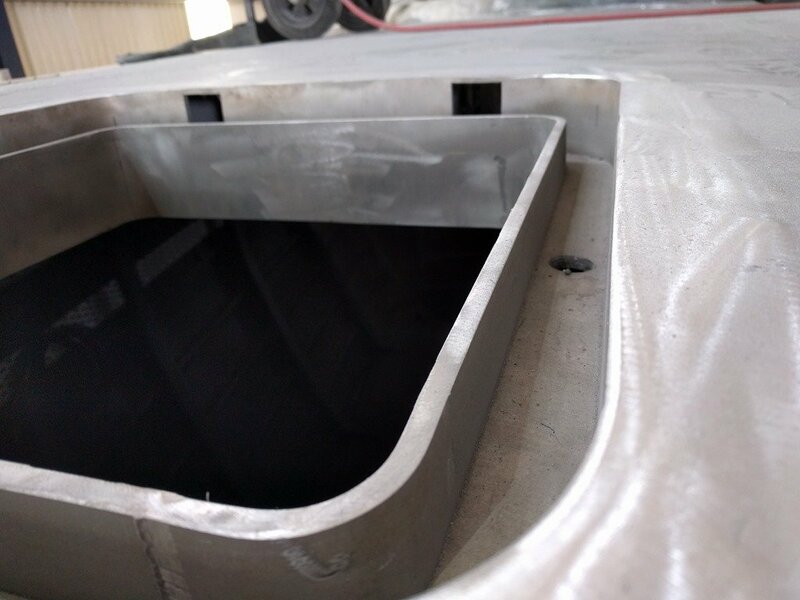 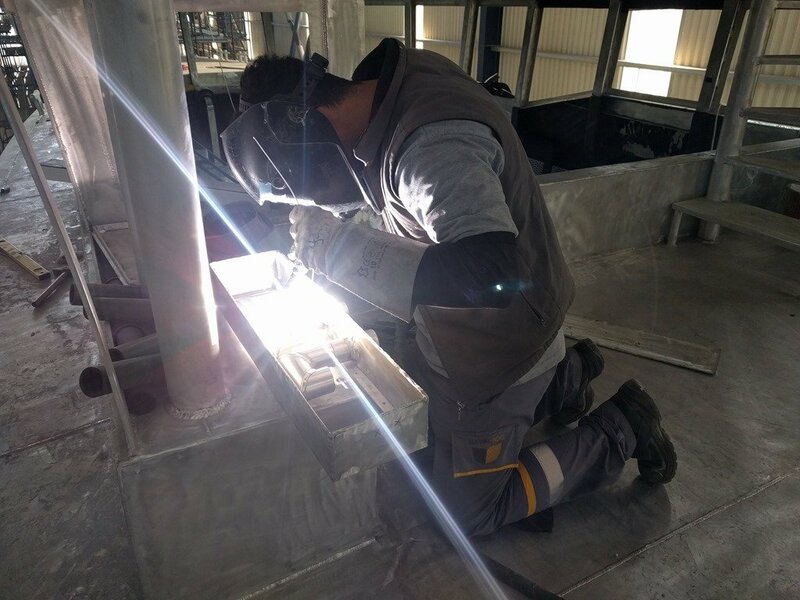 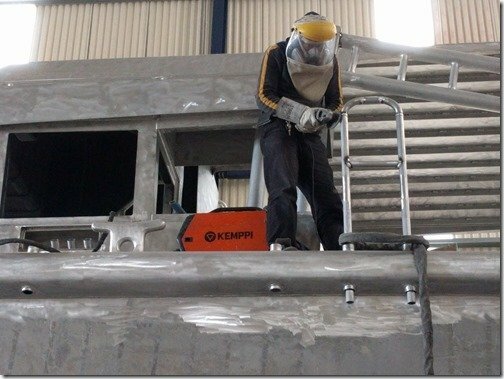 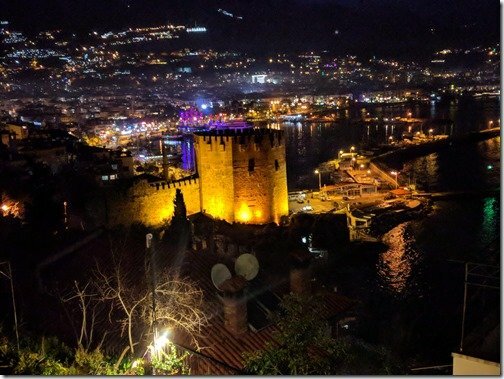 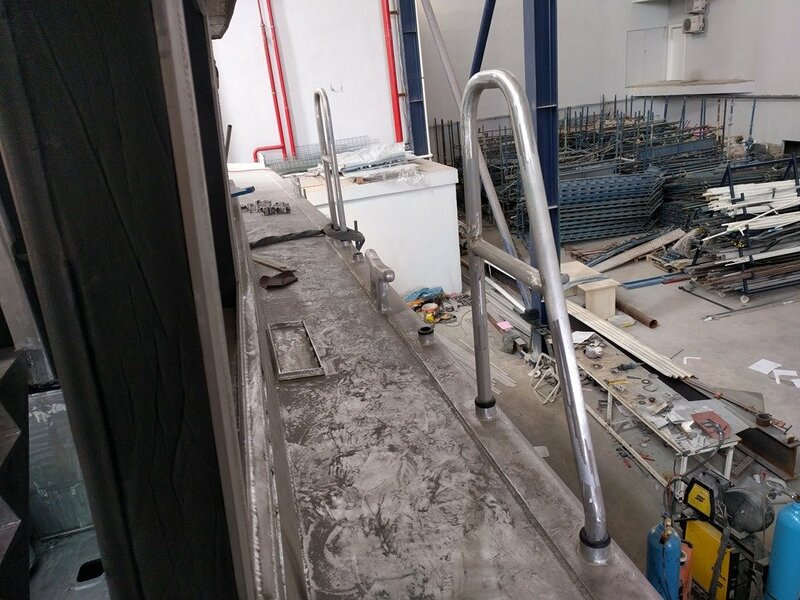 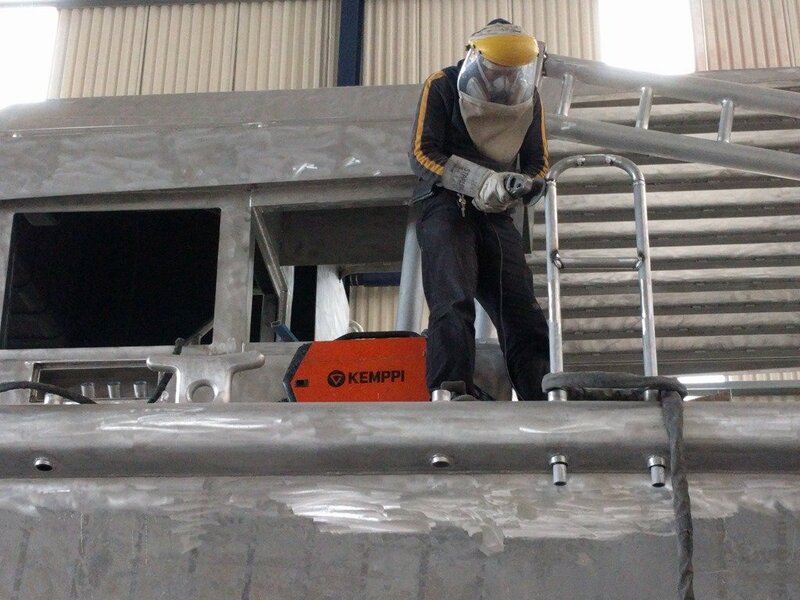 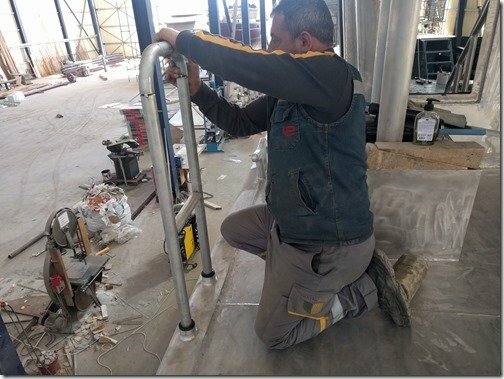 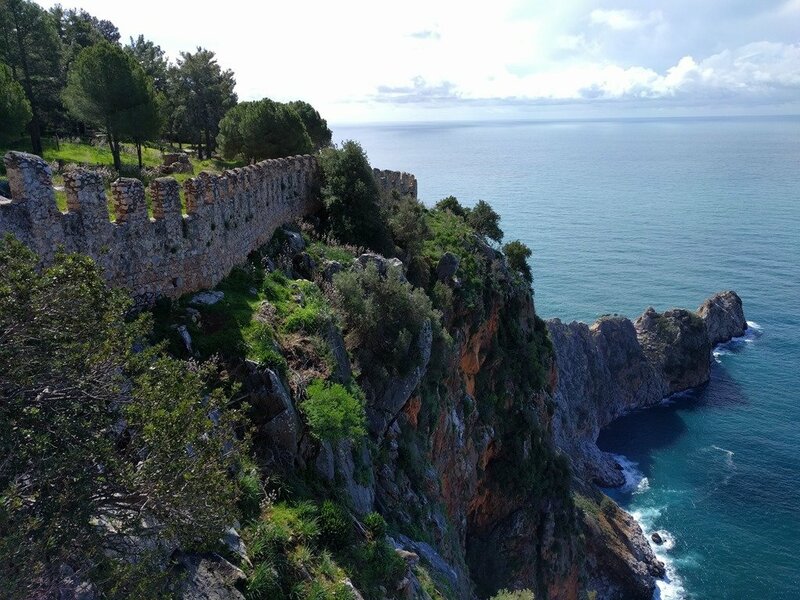 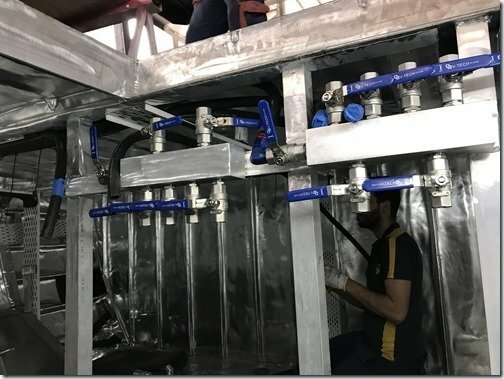 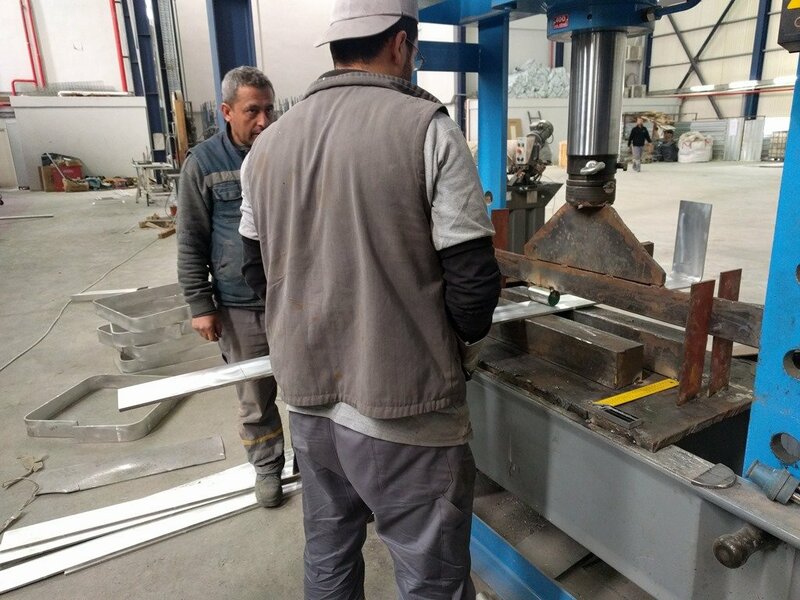 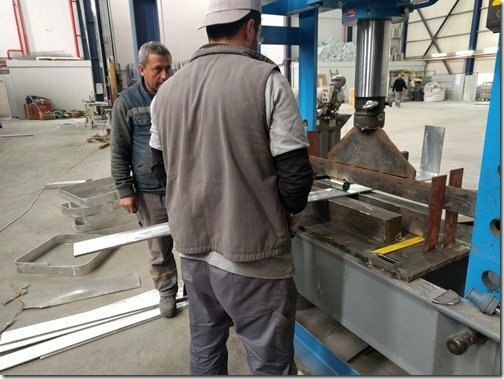 We have tried to centralise most of the things which need somewhat frequent attention such as filling the Day Tank, running the watermaker, adjusting fuel and water manifolds, etc. 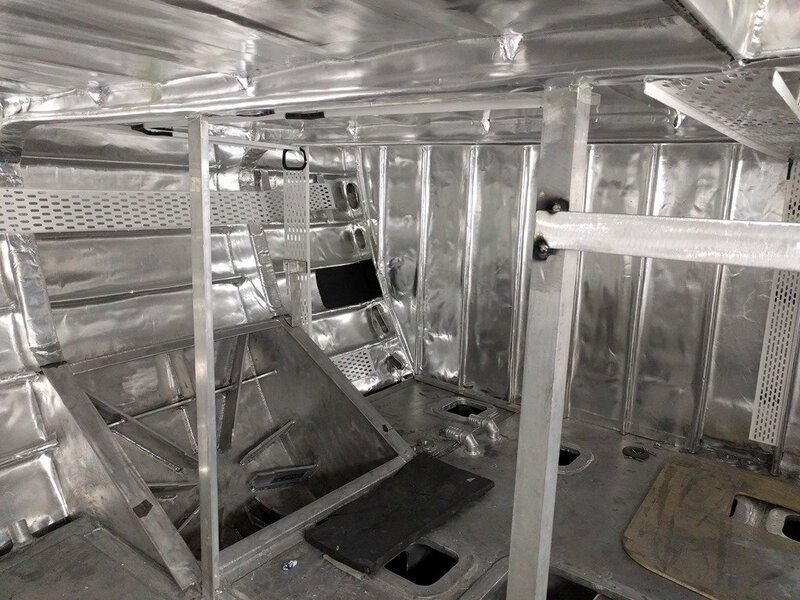 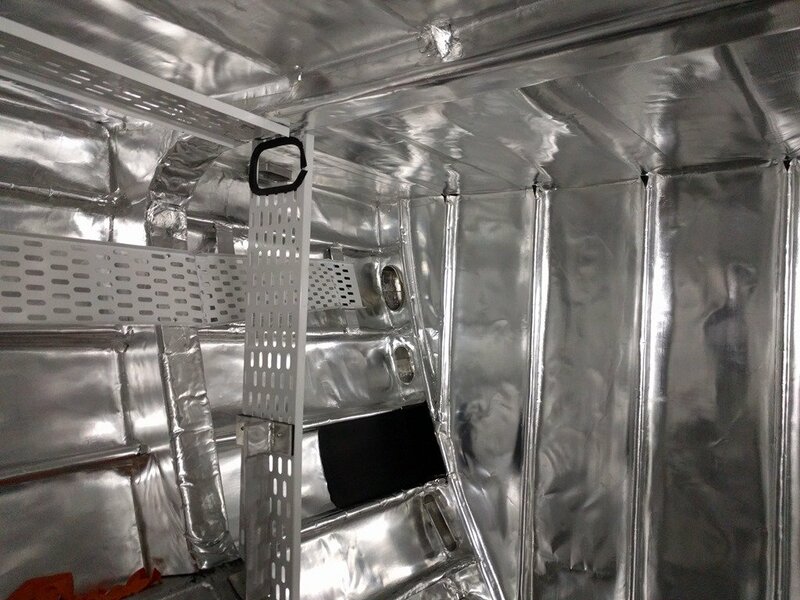 Having this readily accessed area with full standing headroom will be such a treat compared to the cramped spaces on our previous boats and most boats for that matter. 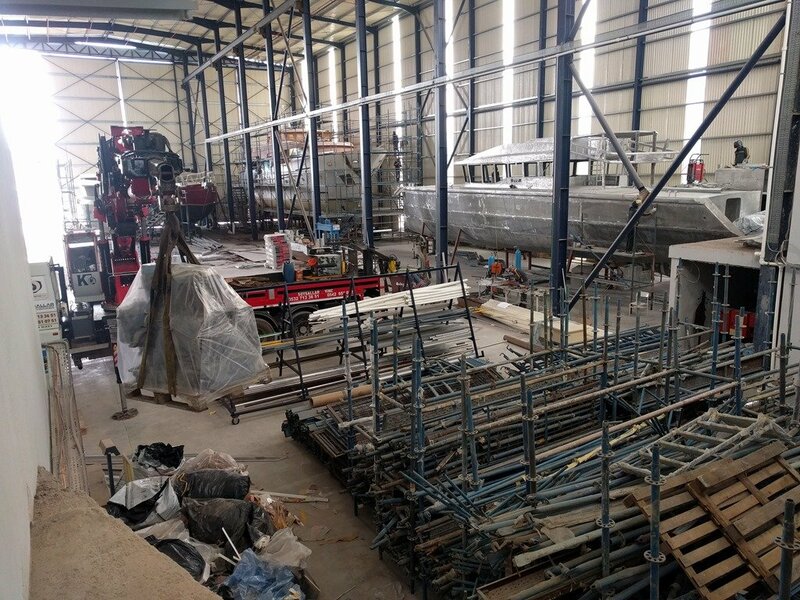 I’m sure I have gone on and on about these workbenches and Workshop but for the guy who has to keep everything working aboard and usually with no shore side resources, this is a BIG deal and I could not be happier with the way it is all working out.or more excited by the prospect of getting to work in such a great Workshop. 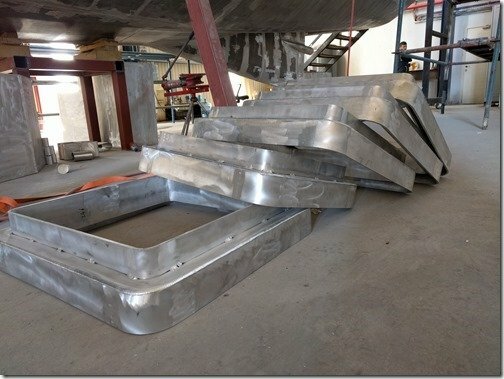 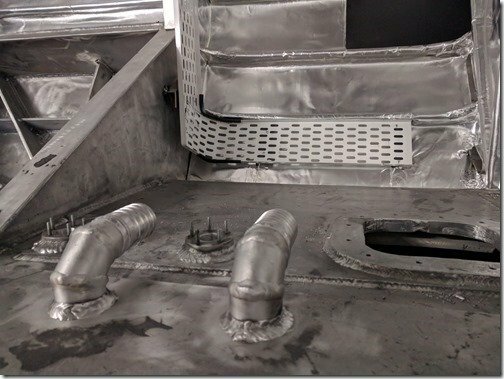 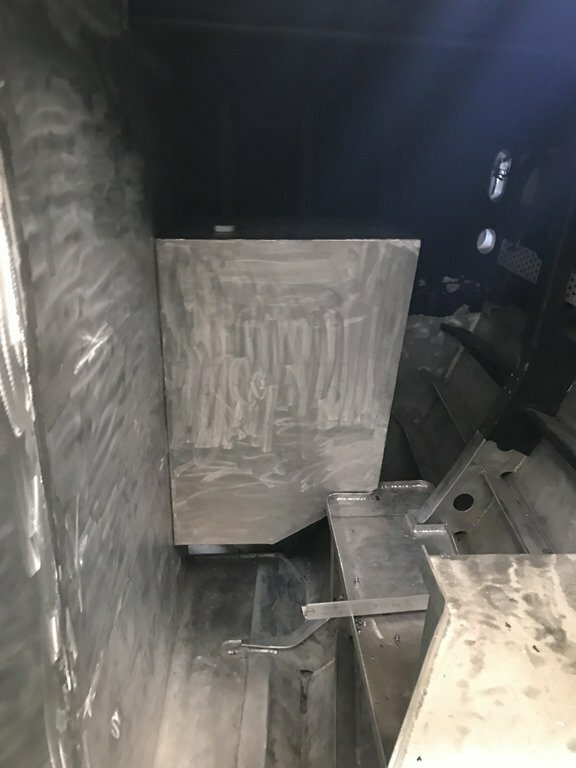 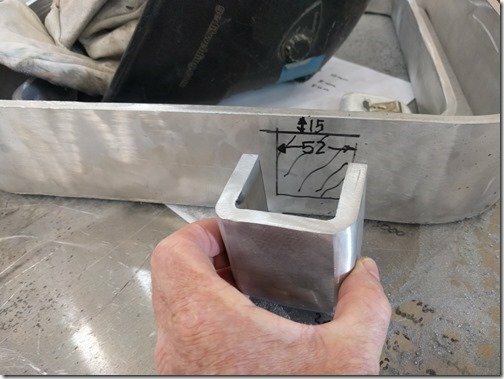 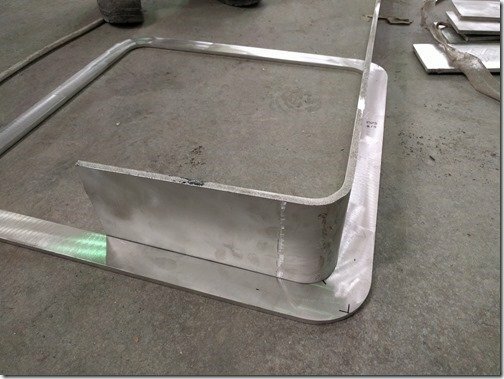 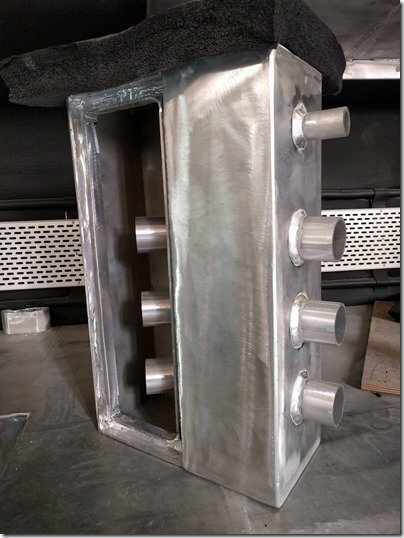 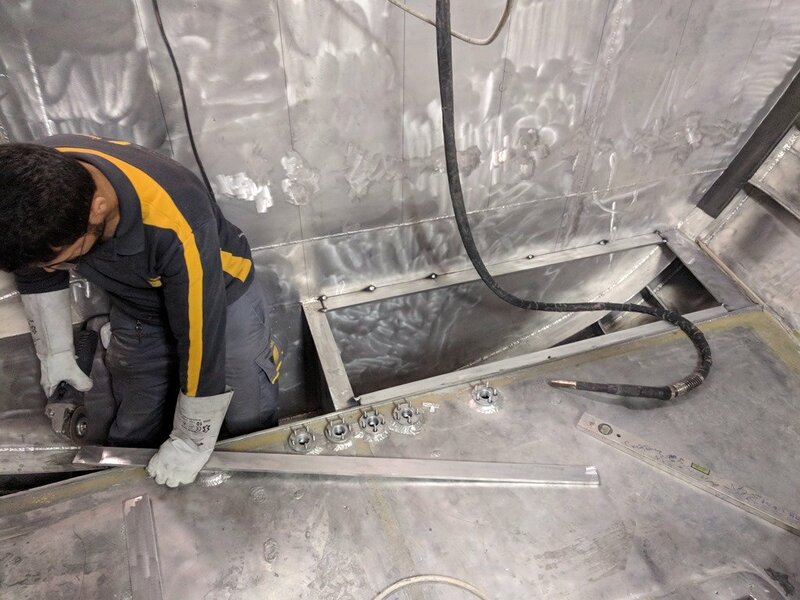 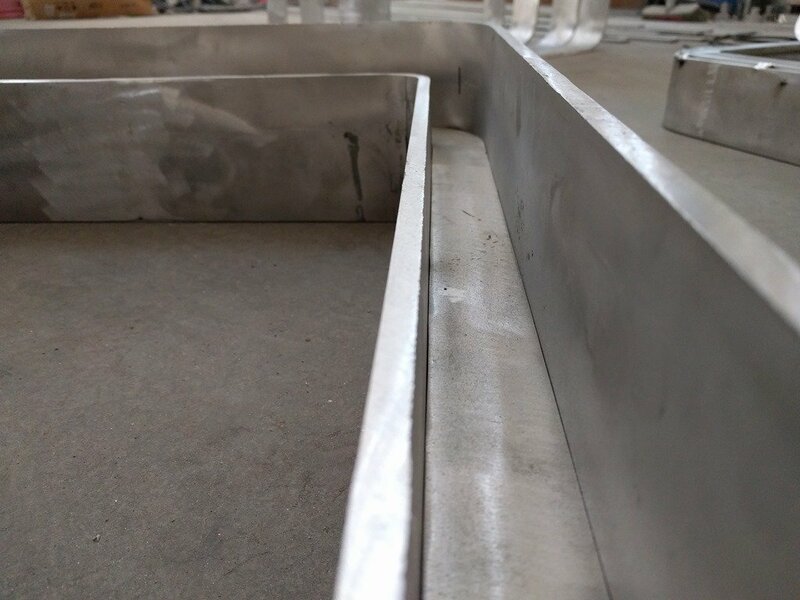 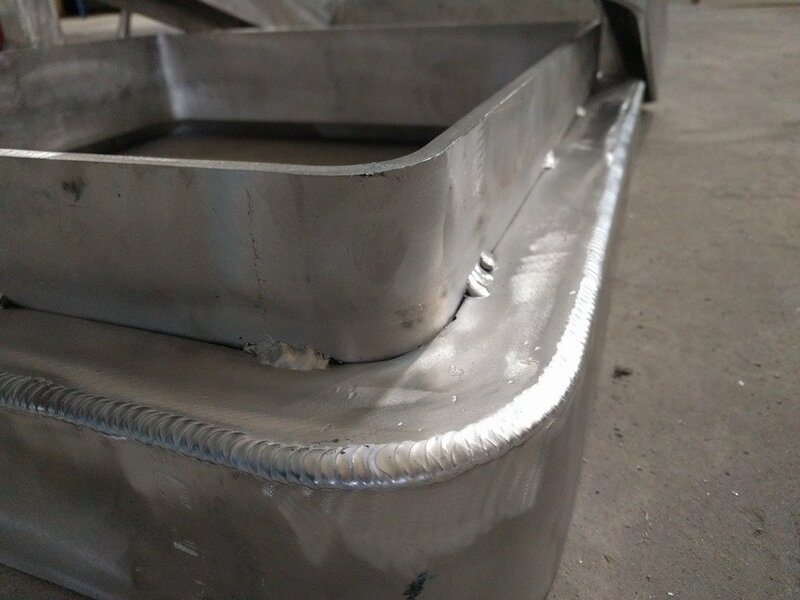 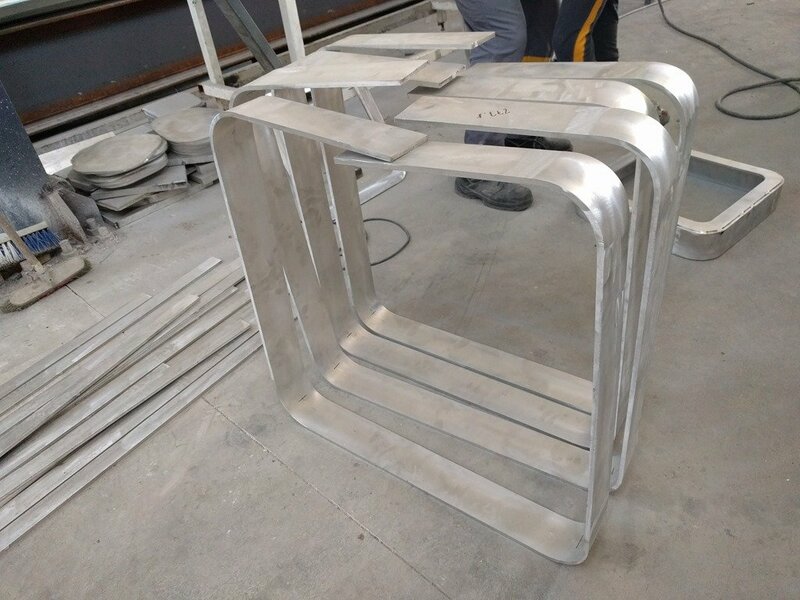 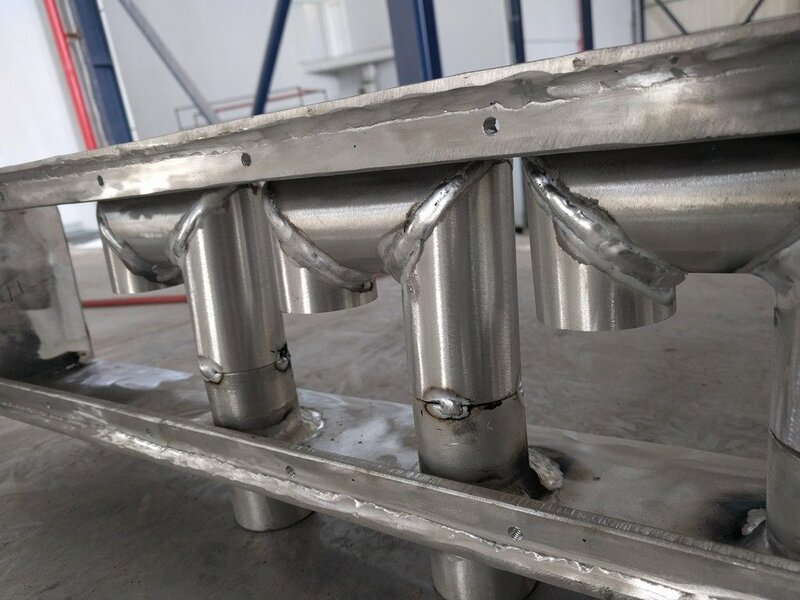 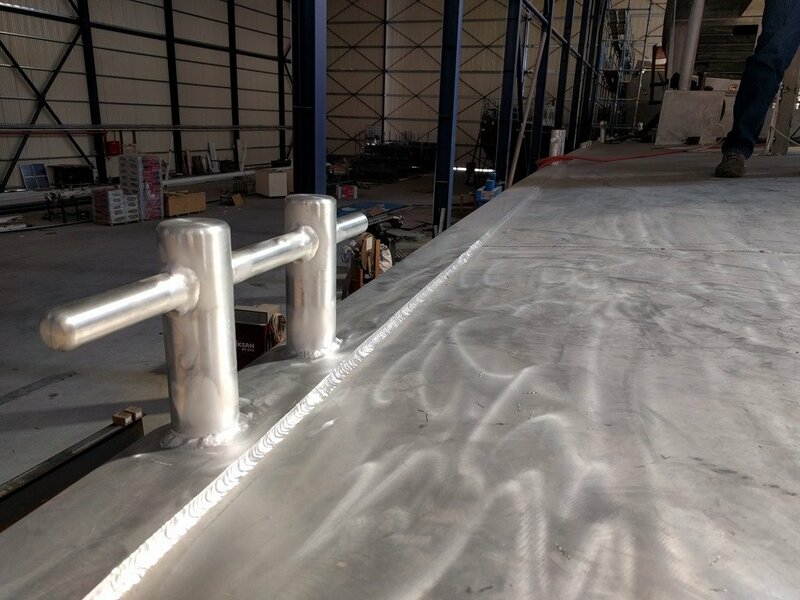 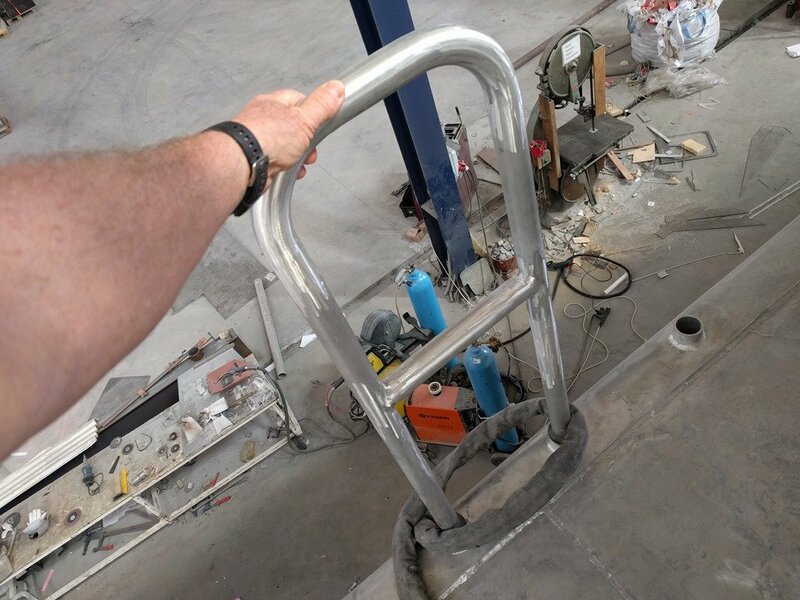 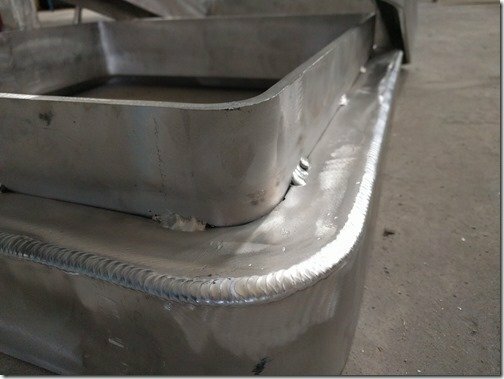 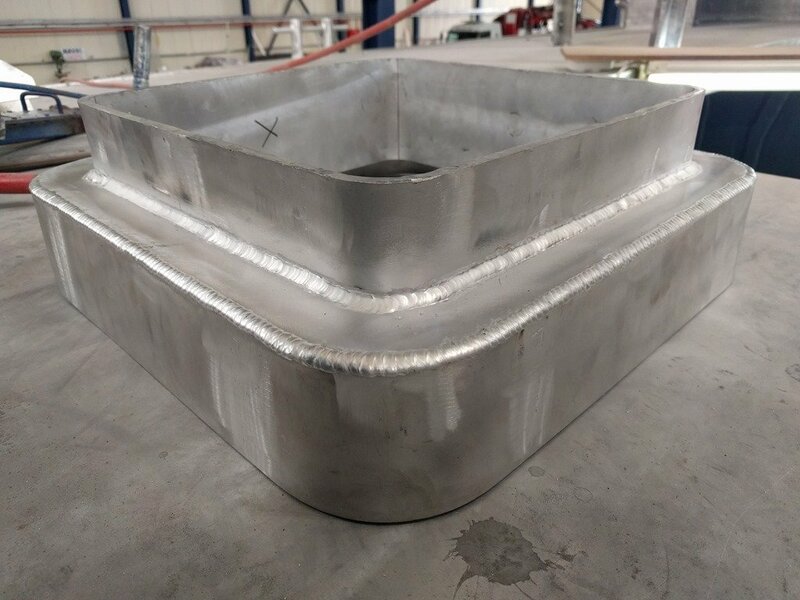 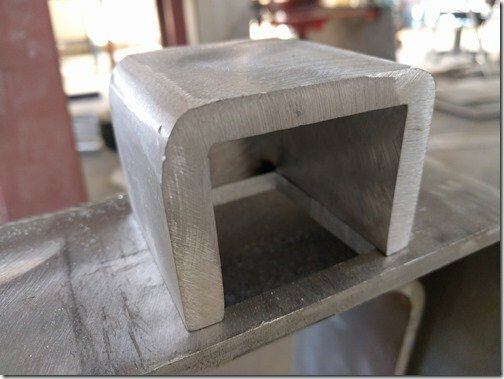 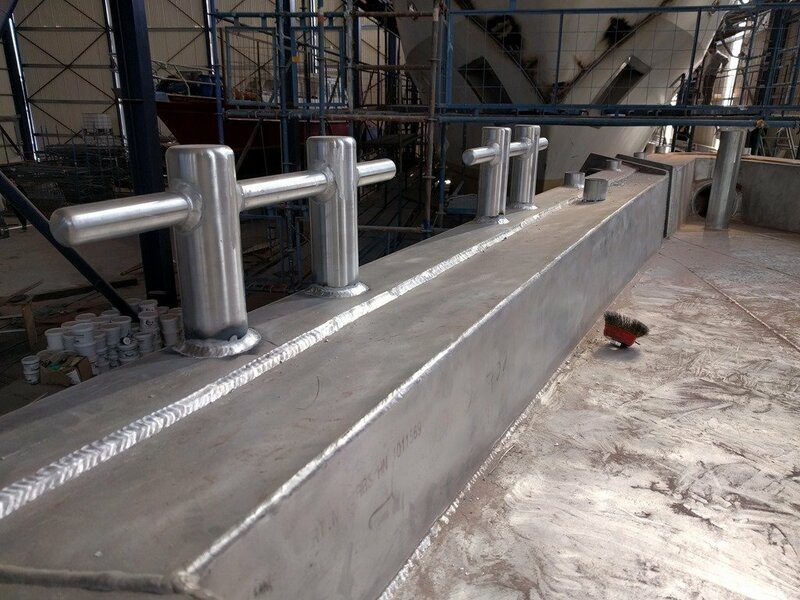 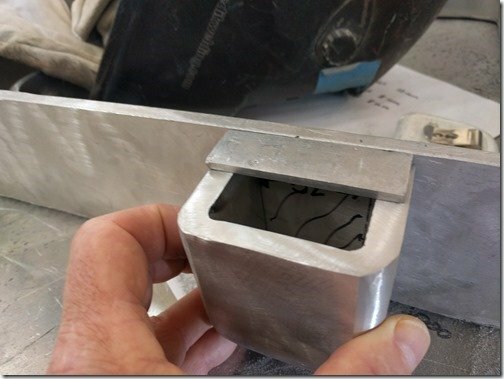 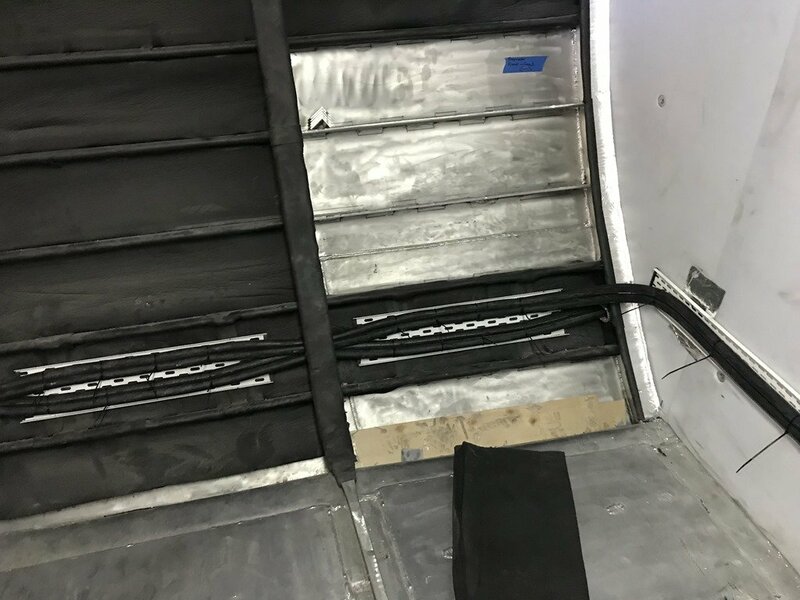 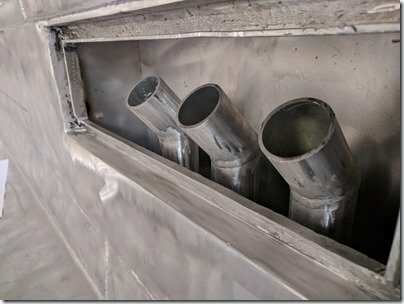 Moving up on deck, the double bollard crossbar style cleats were also finished off this week being fully TIG welded top and bottom through the beefy Rub Rails. 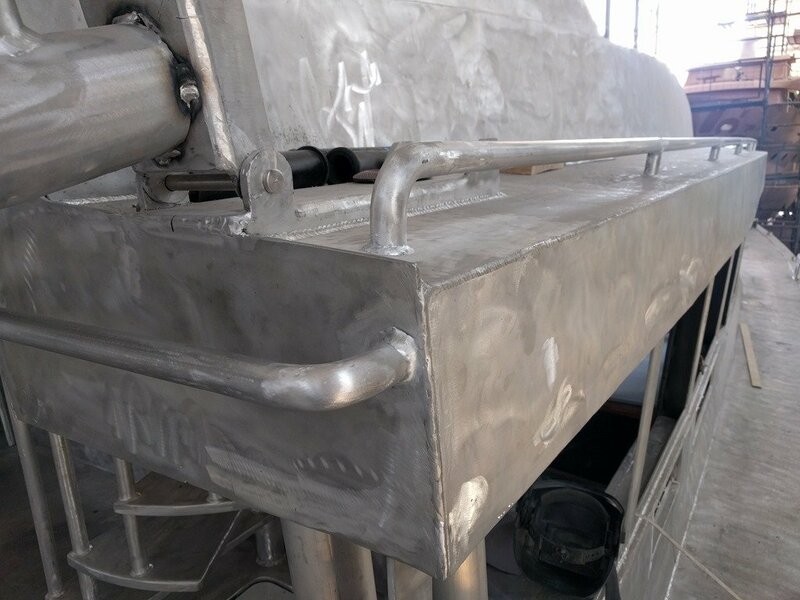 Along with the central big Samson Post you see in the background just behind the big snubber line nose cone, these four cleats at the bow provide plenty of options for any lines we need when docking and tying up to shoreside attachments. 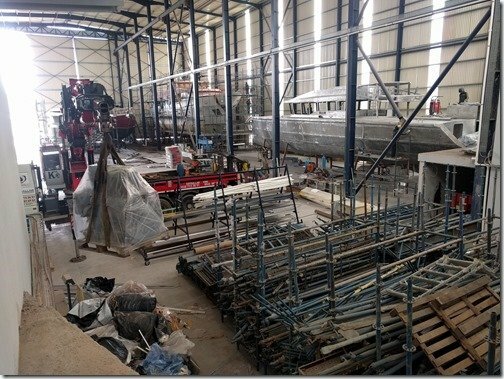 Moving to the very aft Port end and looking forward we see this aft pair of cleats and off in the distance you can make out the two big Crane Cleats which sit between the fore and aft pair of cleats giving us a total of six cleats and fair leads on each side. 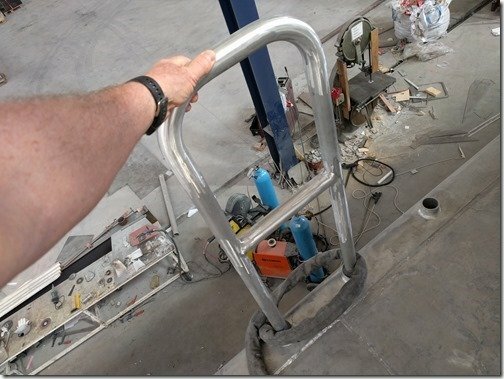 We don’t tie up or go to marinas very often but when we do having all these Xtremely strong and efficient cleats will make it quick and easy to do so. 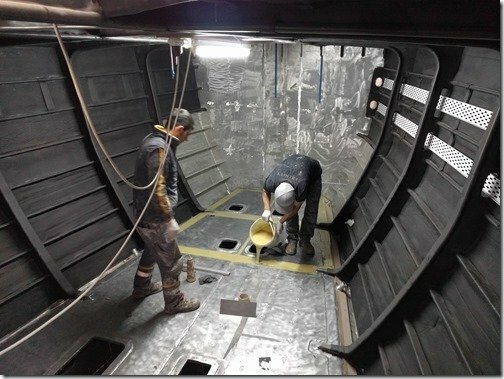 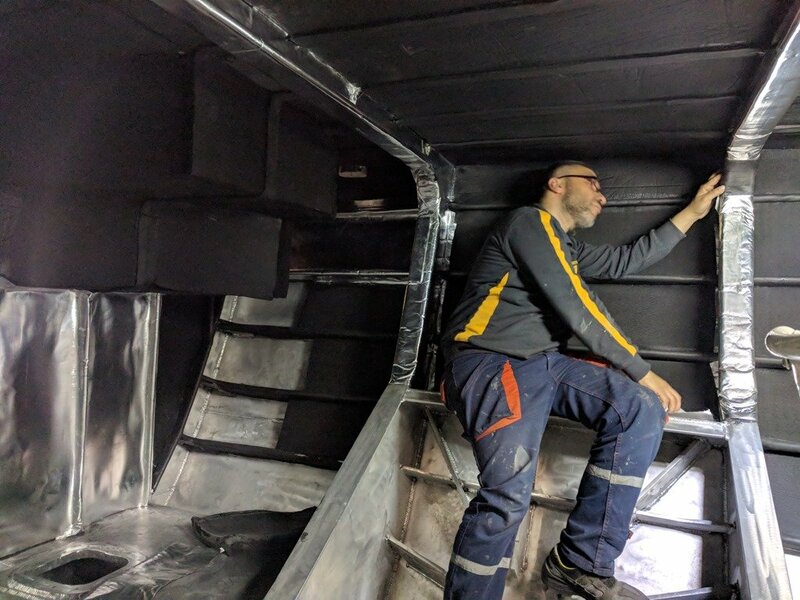 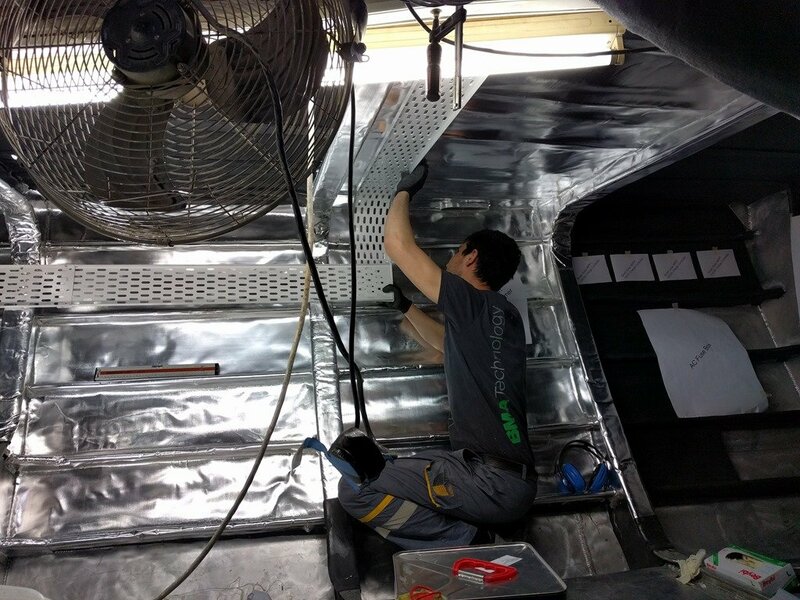 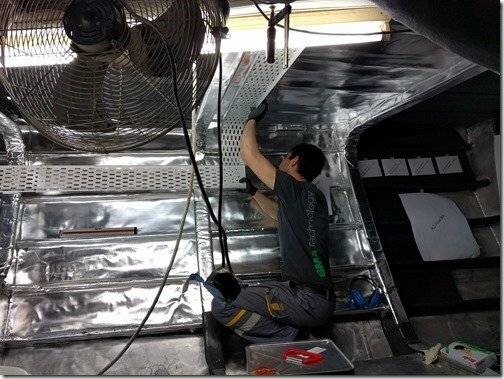 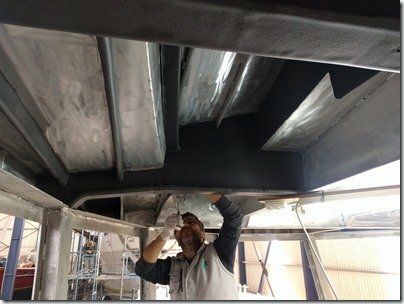 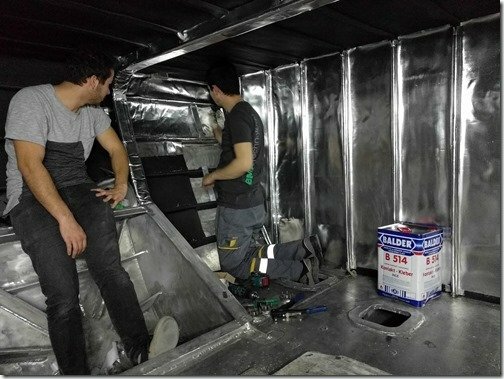 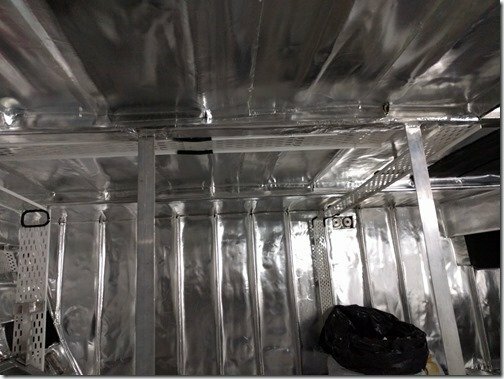 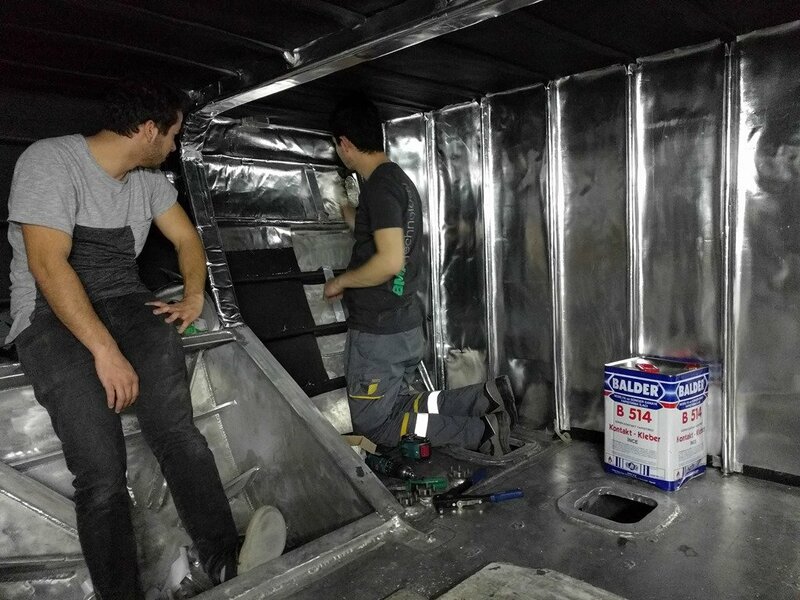 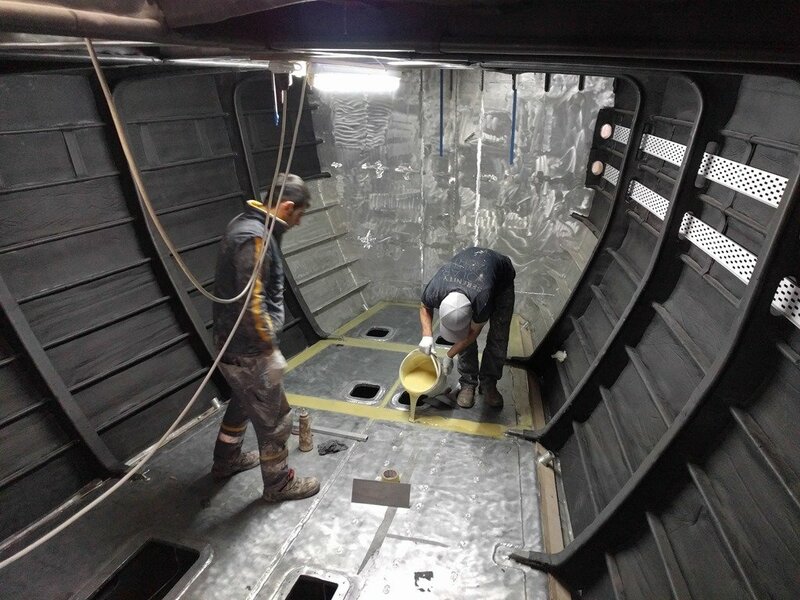 Meanwhile, below decks, more miles of the EPDM insulation continue to be painstakingly installed. 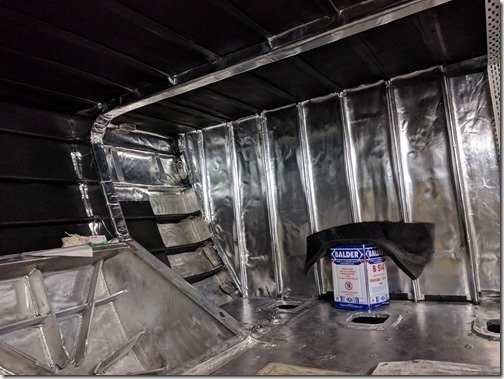 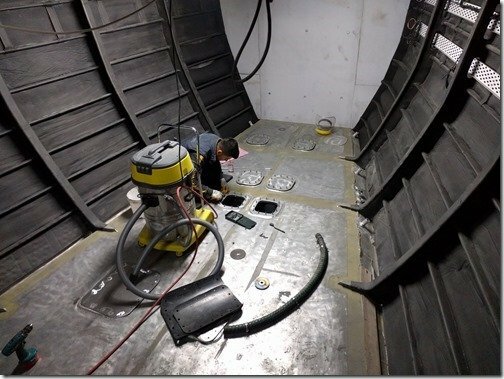 Down in the Basement area below the SuperSalon floor and looking forward at the WT bulkhead with our Master Cabin on the other side shows some of this week’s insulation progress. 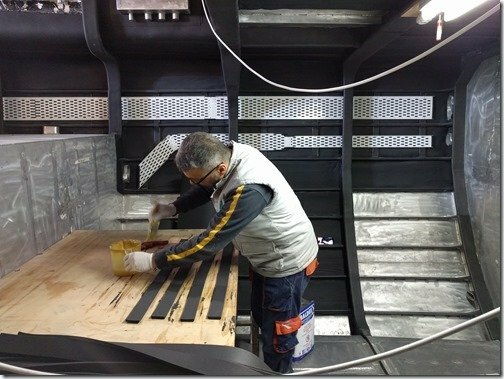 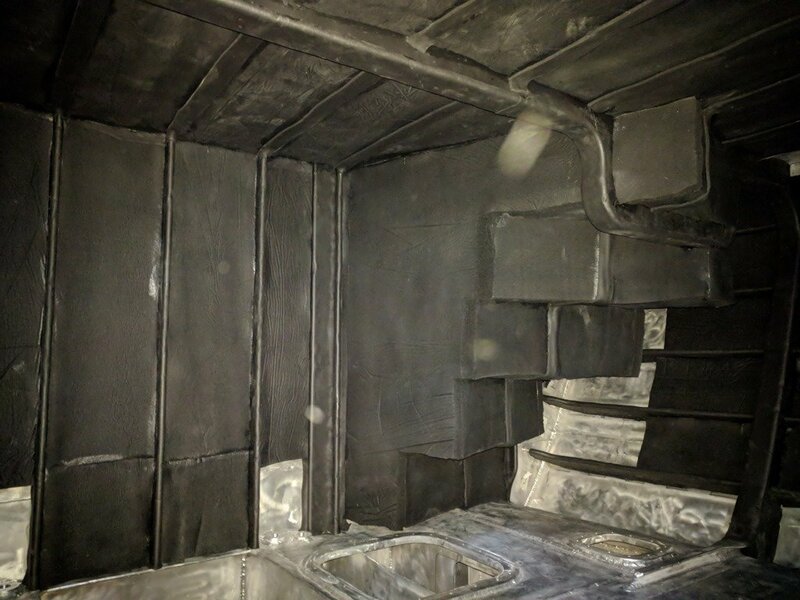 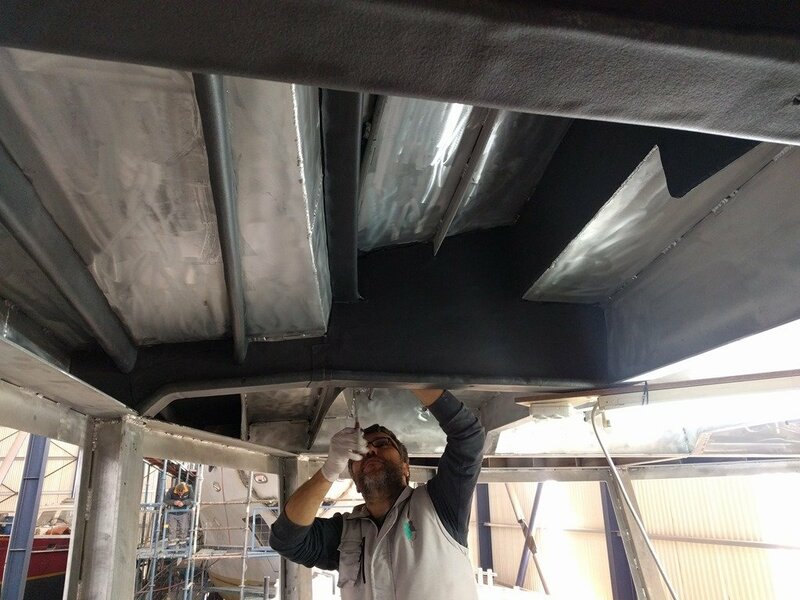 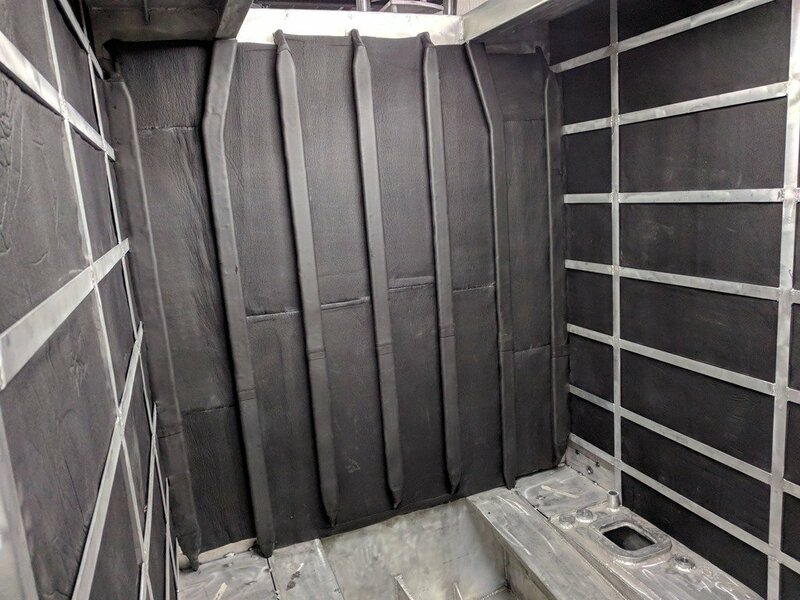 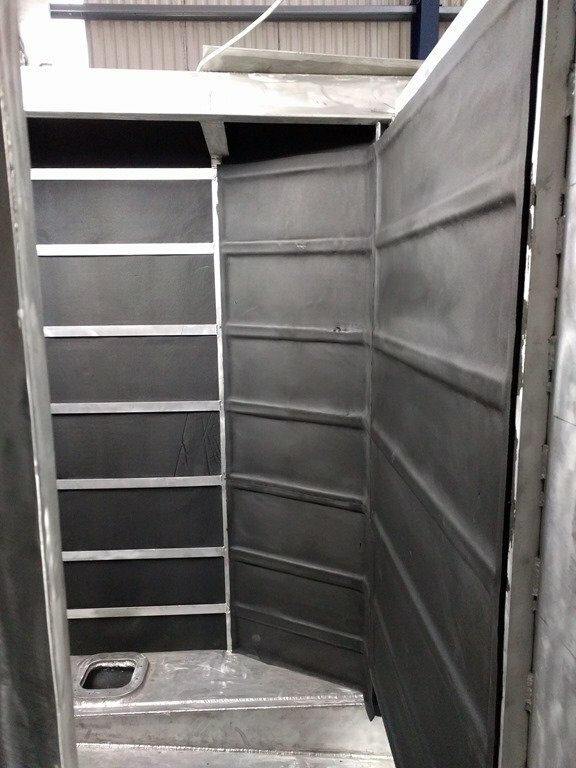 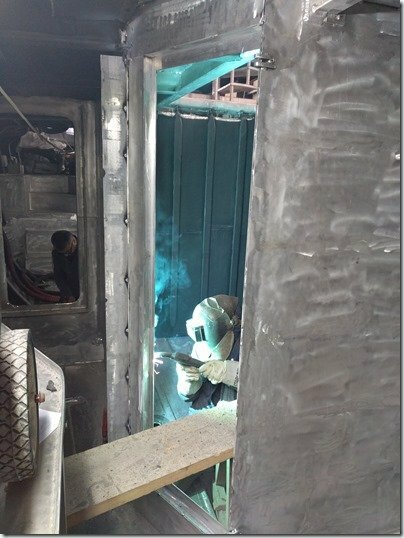 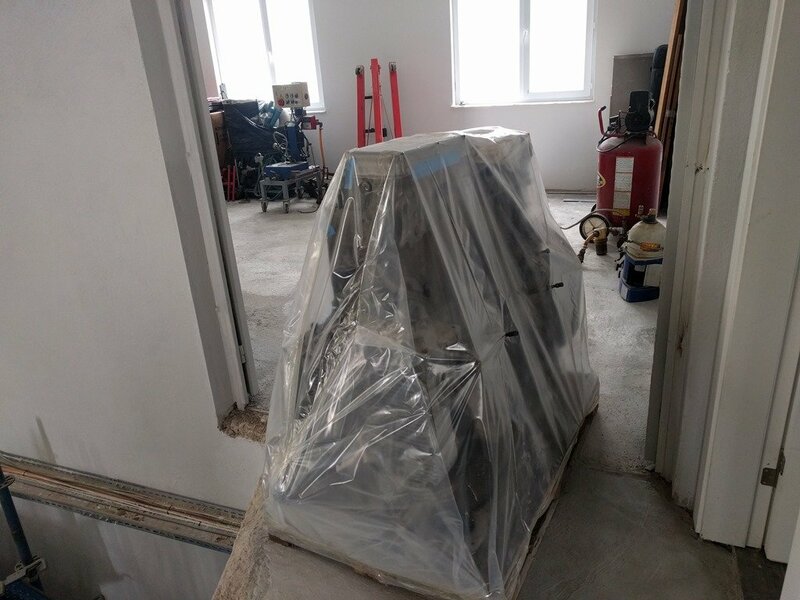 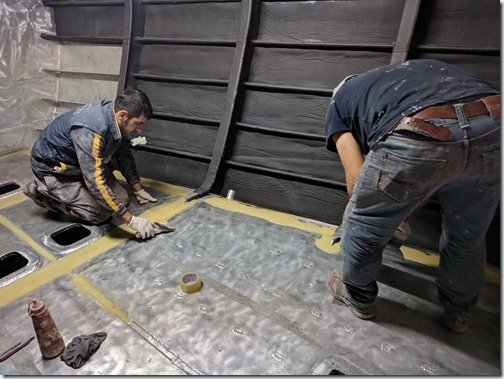 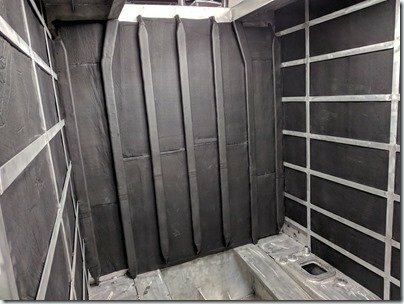 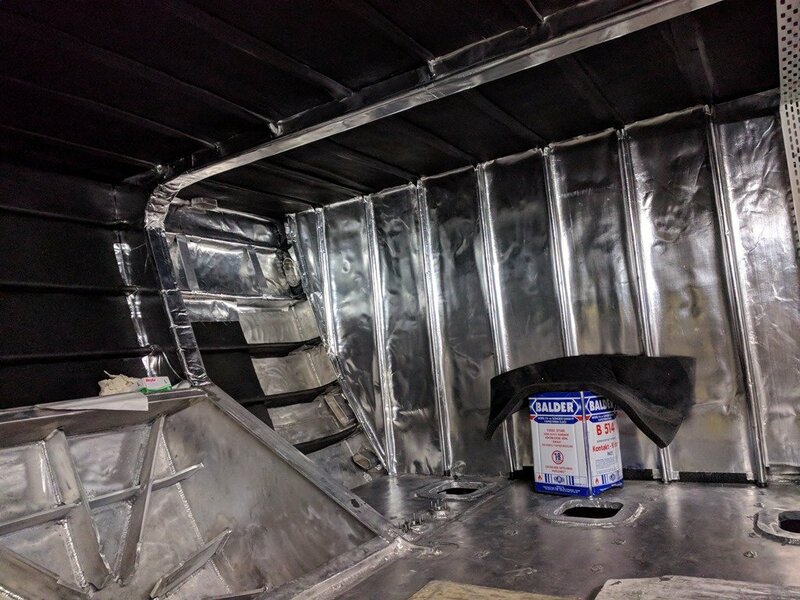 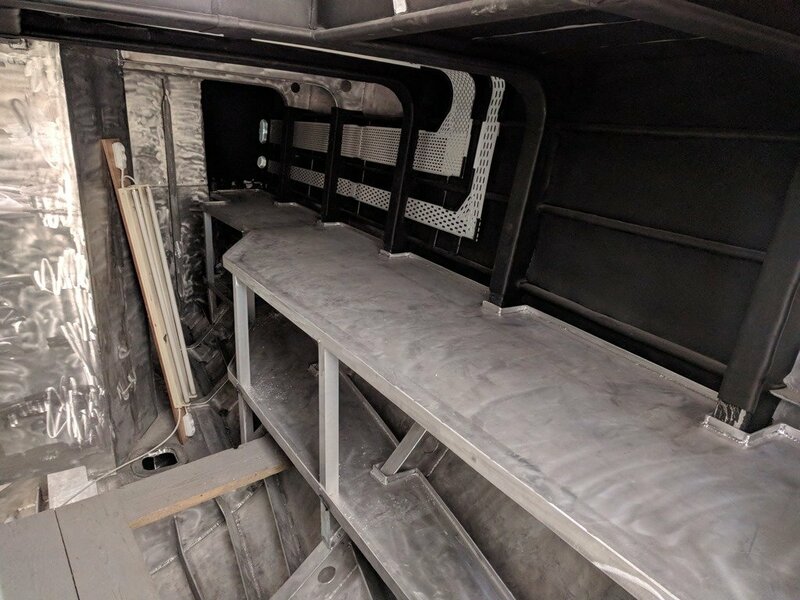 Over on the forward Starboard side of the Basement the stairs leading down into our Master Cabin are almost fully clad in 50mm EPDM and the remaining unclad walls and ceiling areas will soon be done as well. 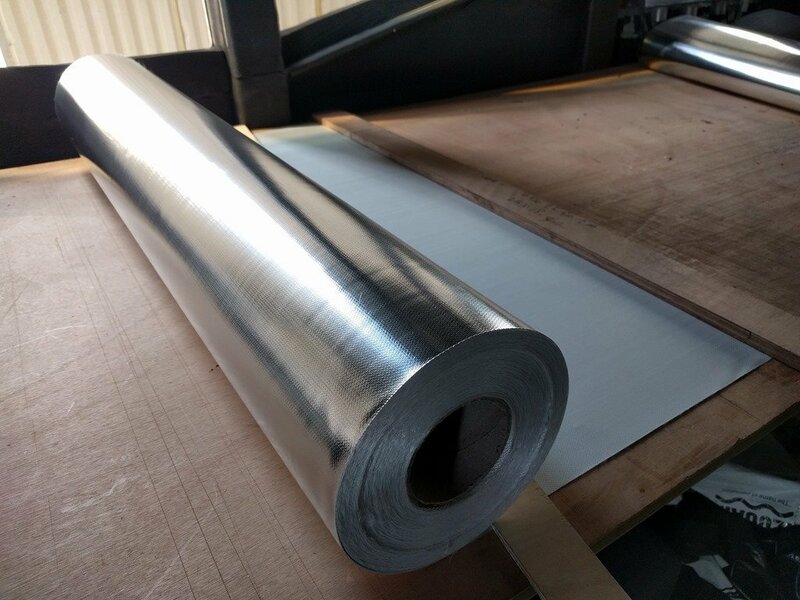 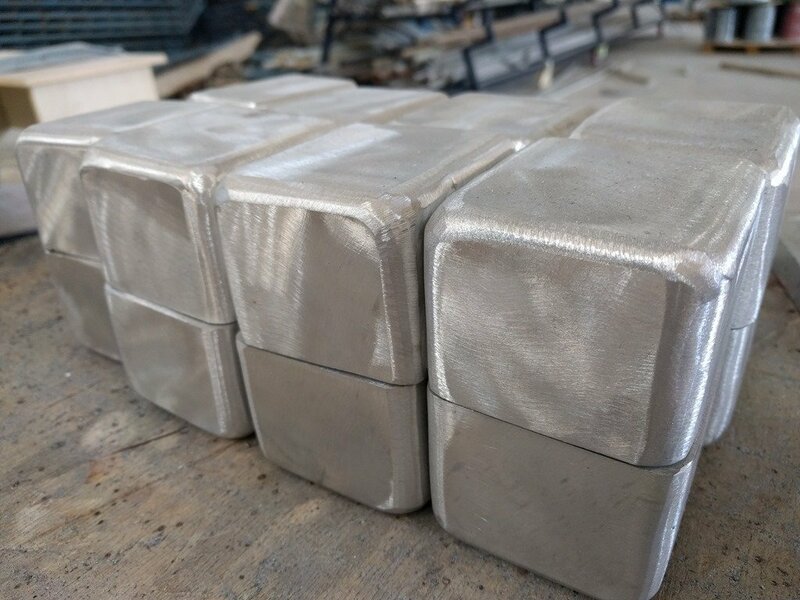 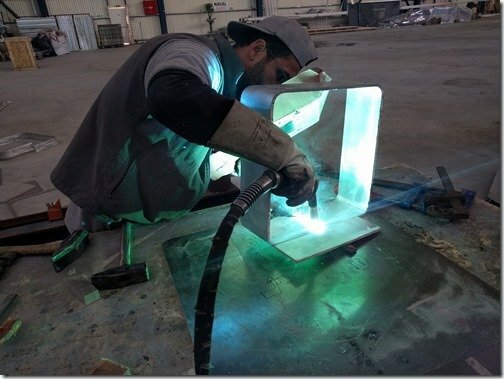 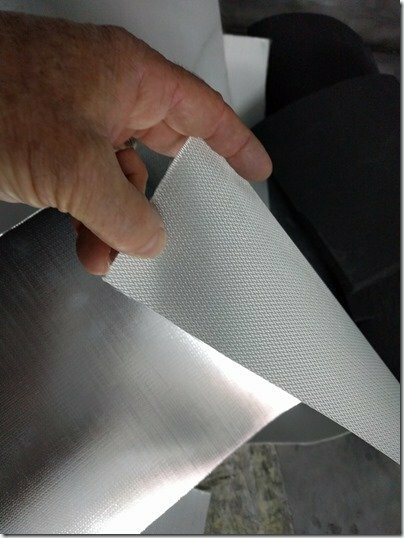 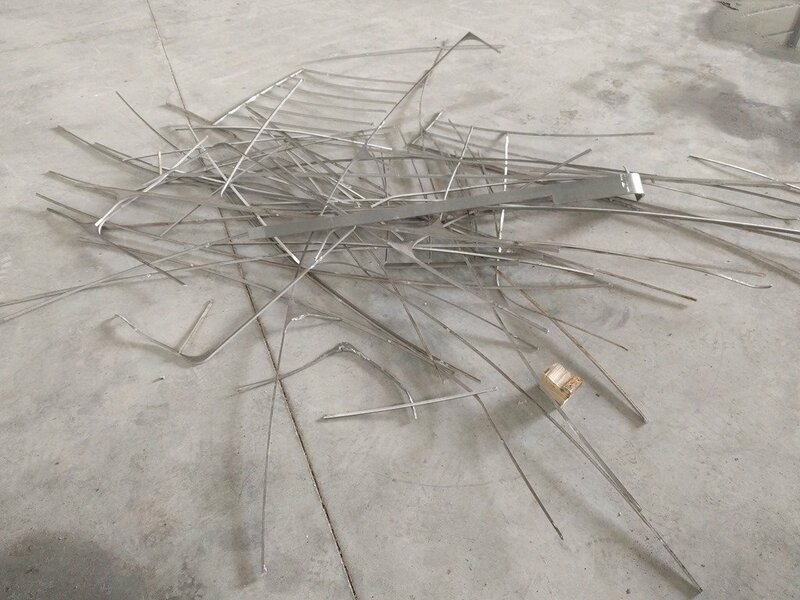 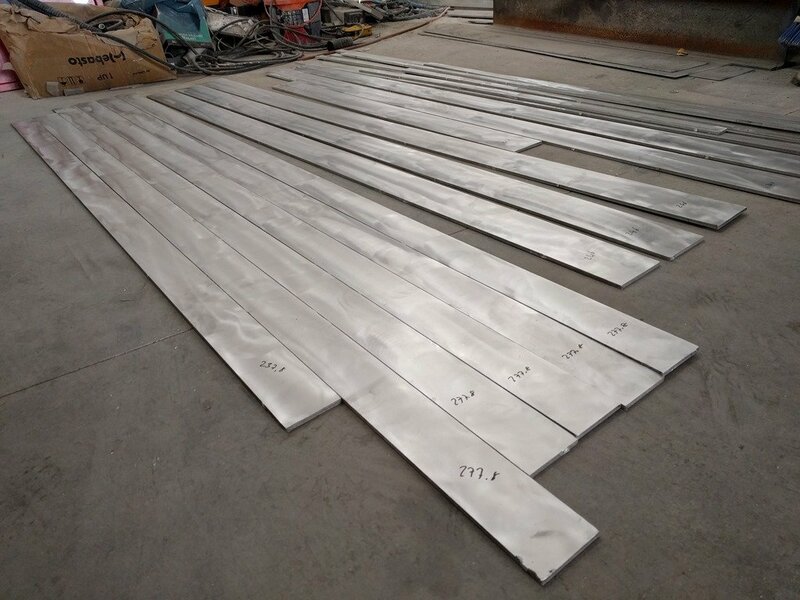 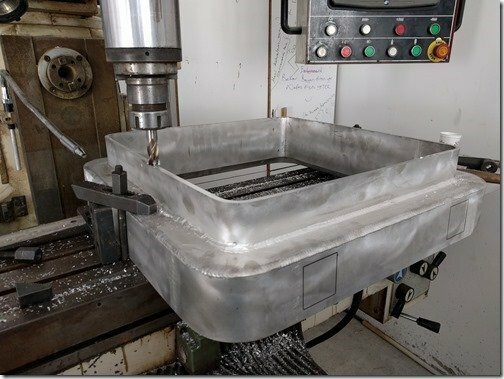 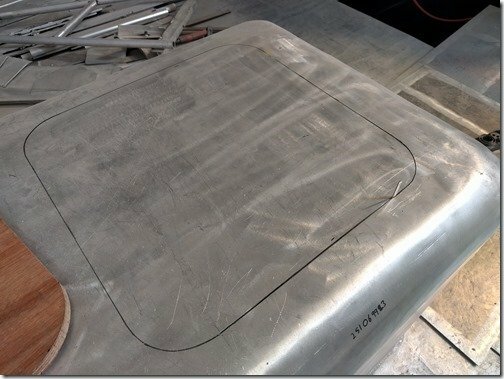 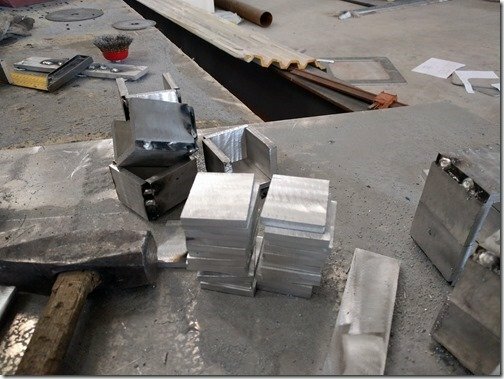 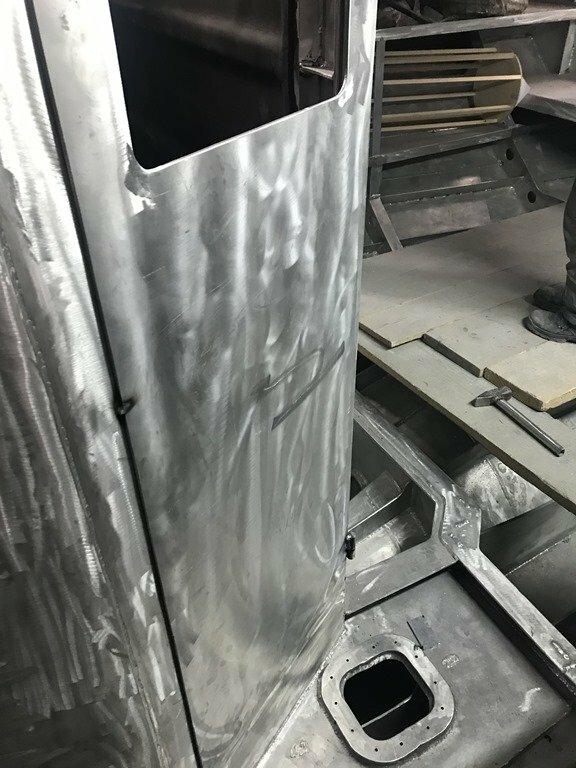 Finishing up this week’s update with something new, can you guess what this beautiful bit of aluminium sculpture is going to be? 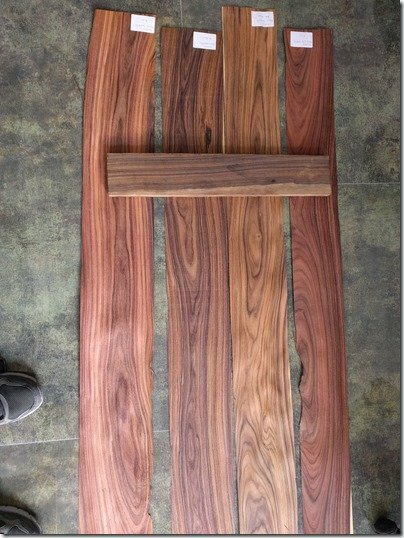 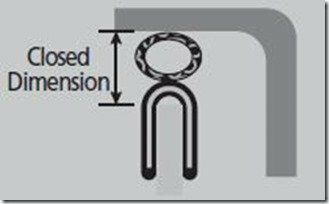 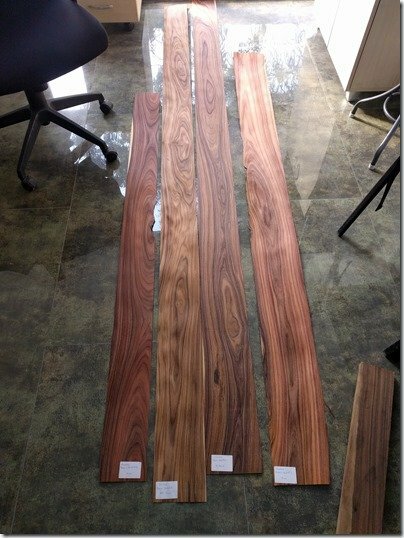 Will it help if I tell you that when installed this will be rotated 90 degrees clockwise from what you see here? This is the one of the Fuel Fill boxes we’ve designed based on our years of less than satisfying ways of filling up boats with diesel fuel. 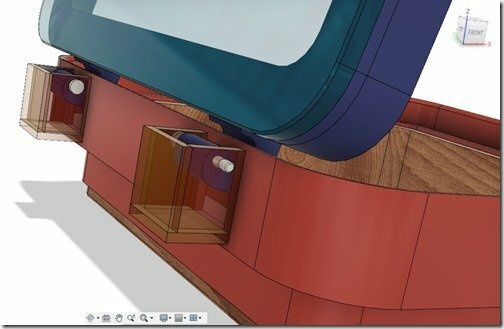 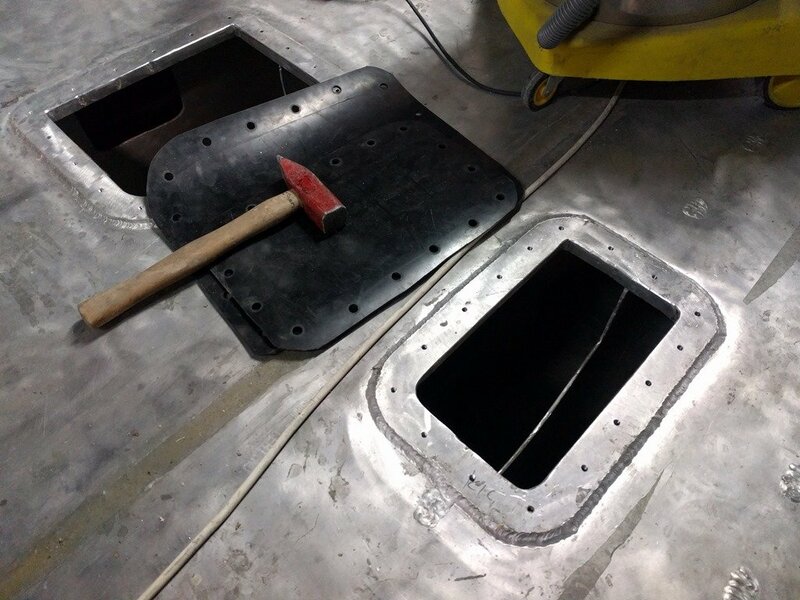 The most common design is to have all the fuel fills mounted flush with the side decks down where you see the hammer and plans in this photo, with each fill having a round threaded cap with a rubber O-ring seal. This works, but not well in our experience and has many drawbacks most notably that when raining or if the seals ever leak you get water flowing directly into your fuel tanks. 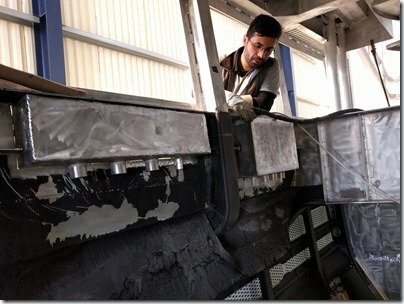 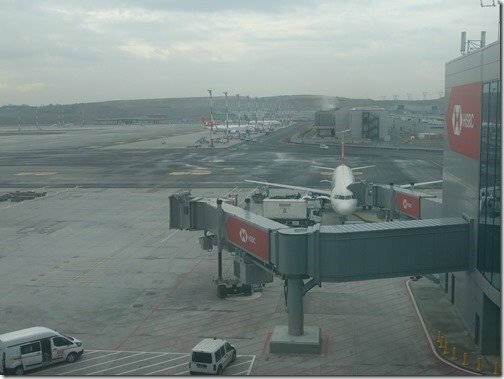 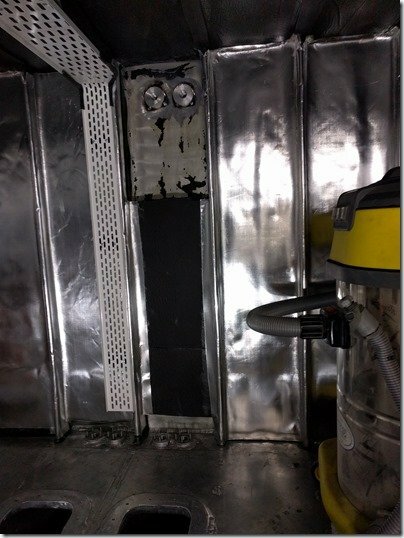 More common and problematic, when, not if, you have the inevitable spills while fueling up all the diesel is now running along the decks and worse over the sides. 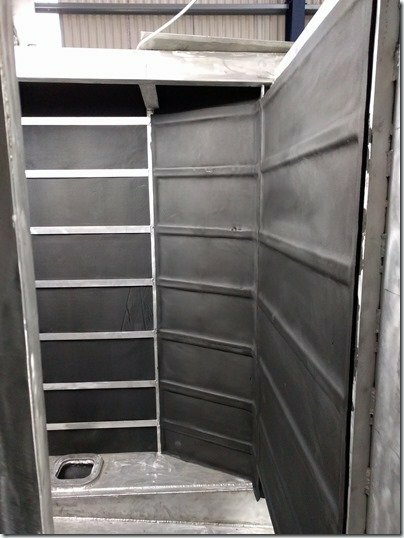 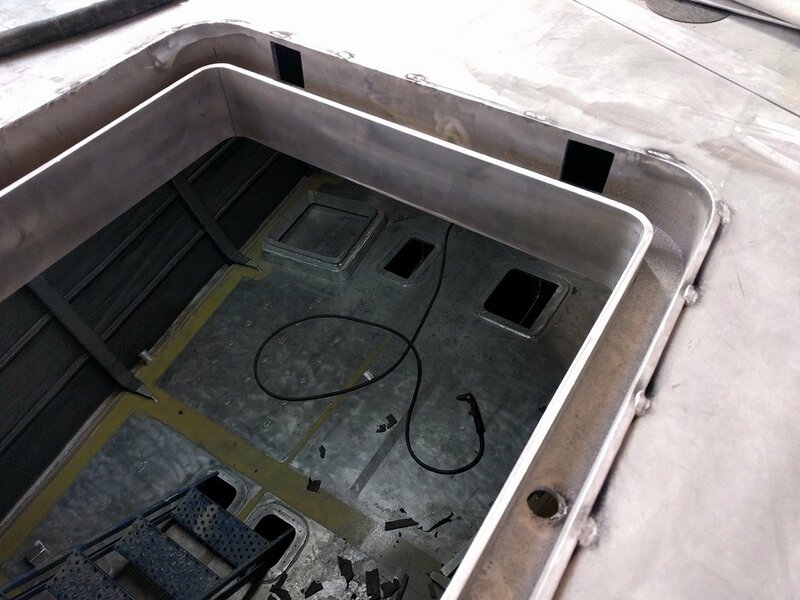 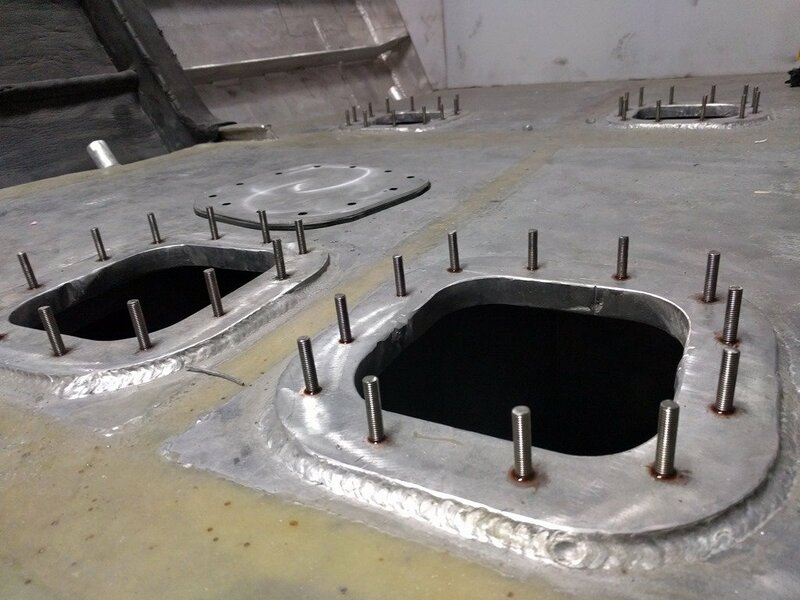 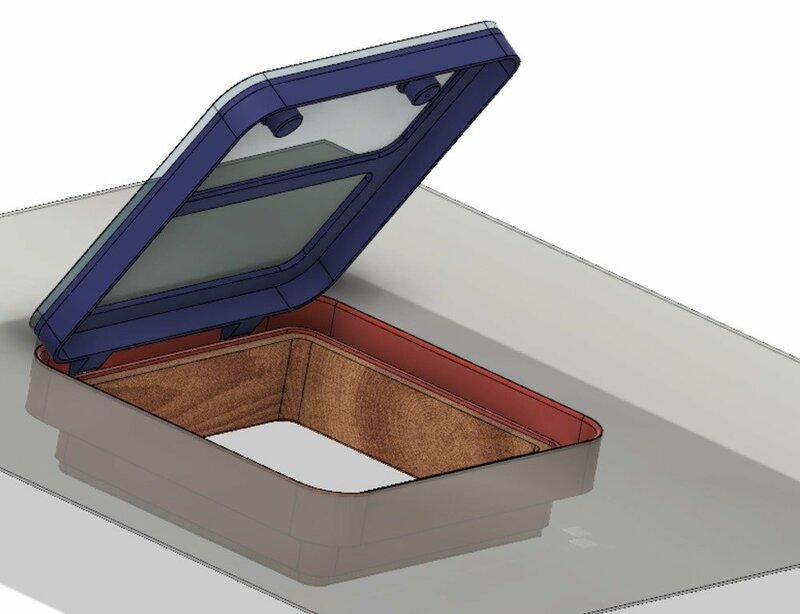 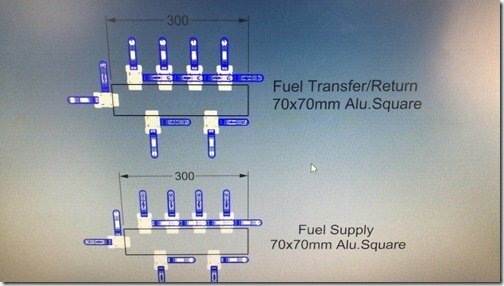 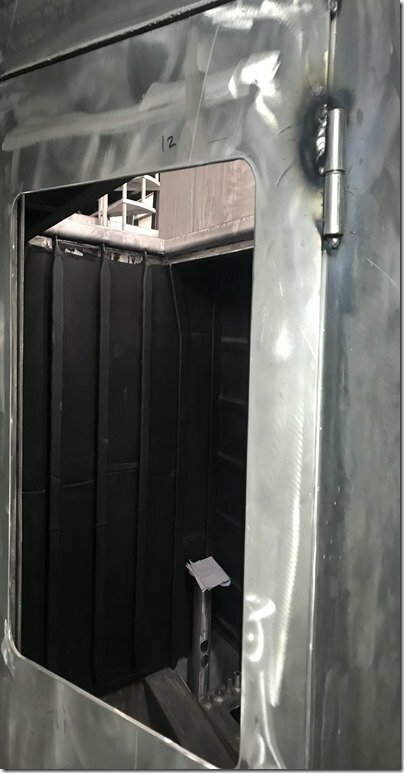 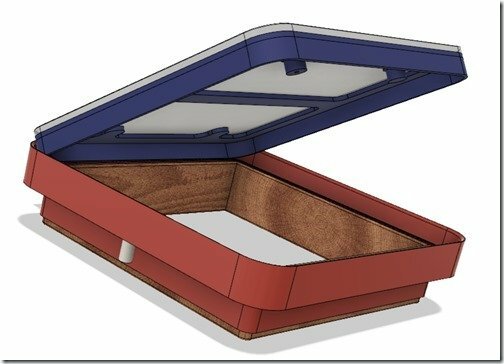 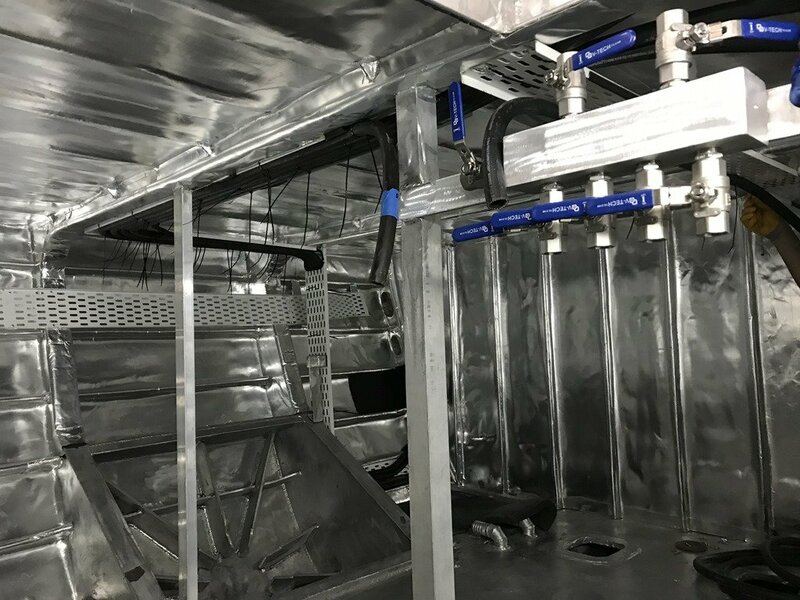 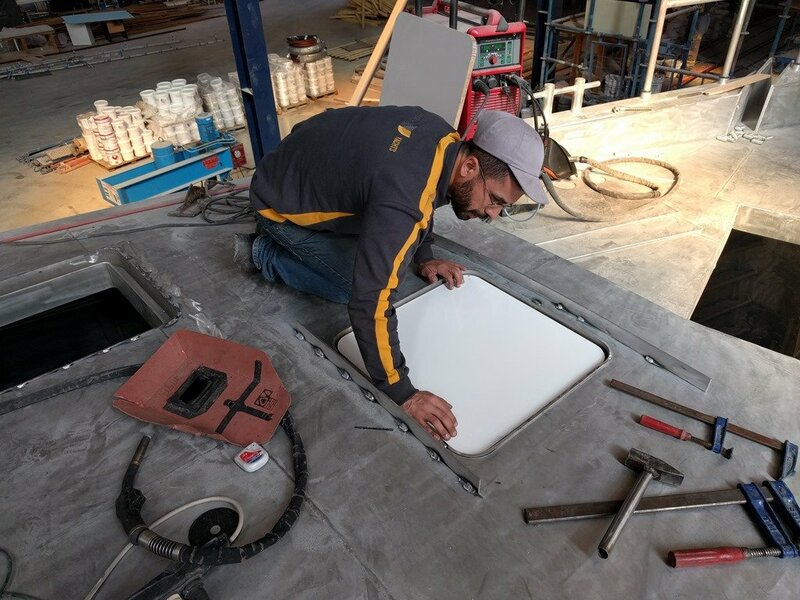 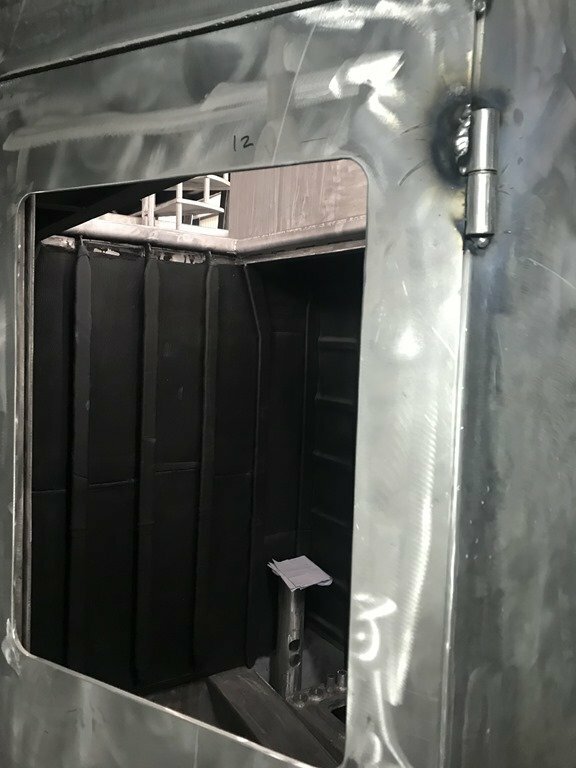 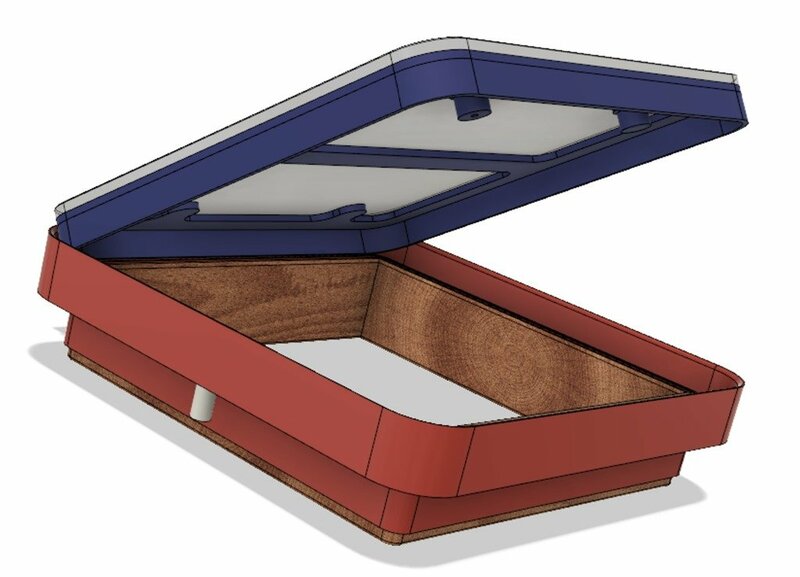 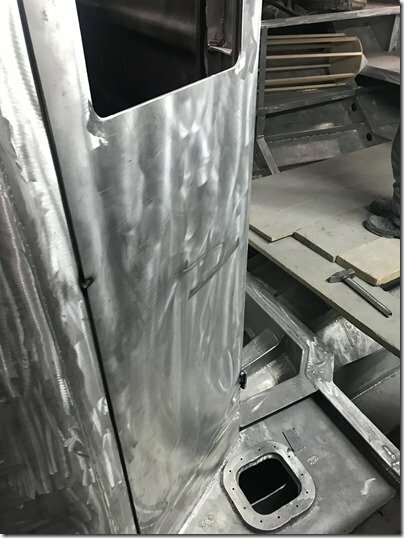 Instead, we’ve designed these Fuel Fill boxes which are mounted vertically on the aft sides of the Pilot House with fully sealed fold down and locking doors on the outside. 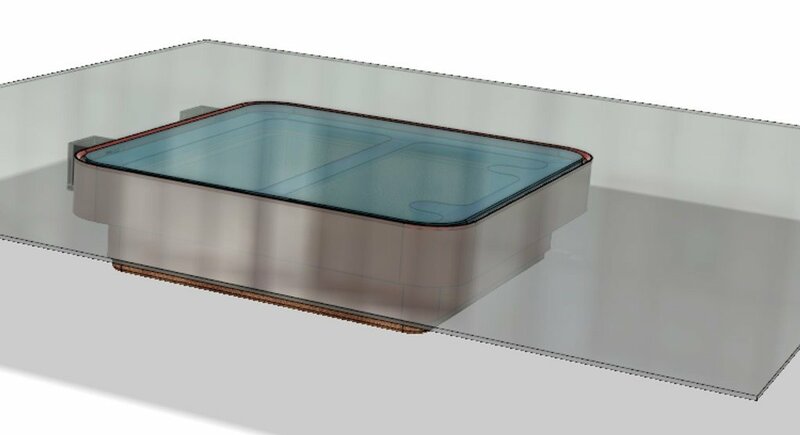 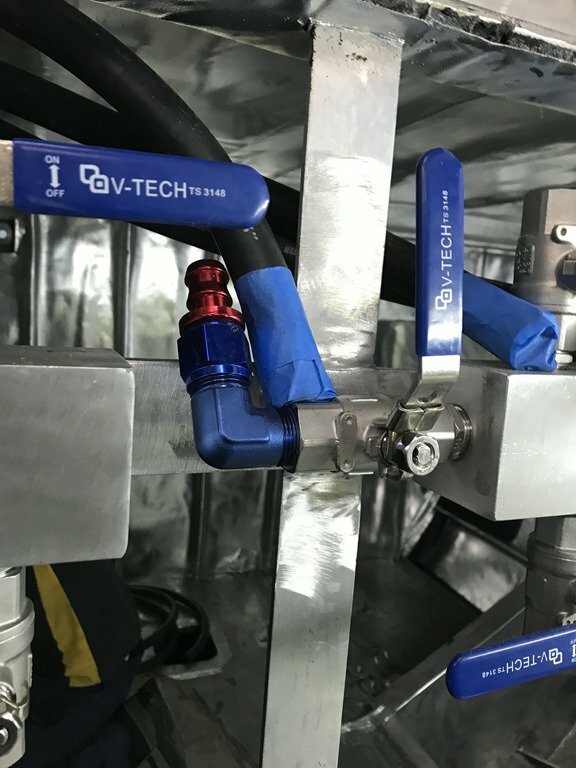 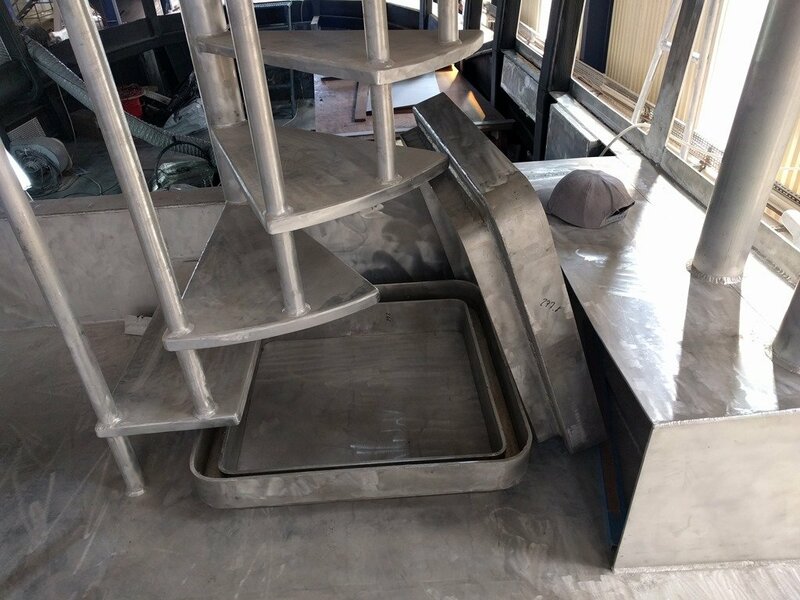 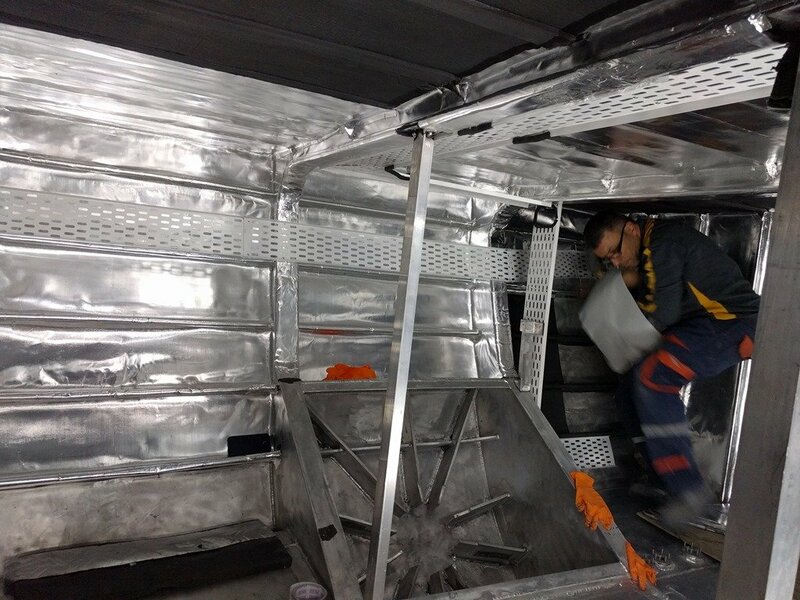 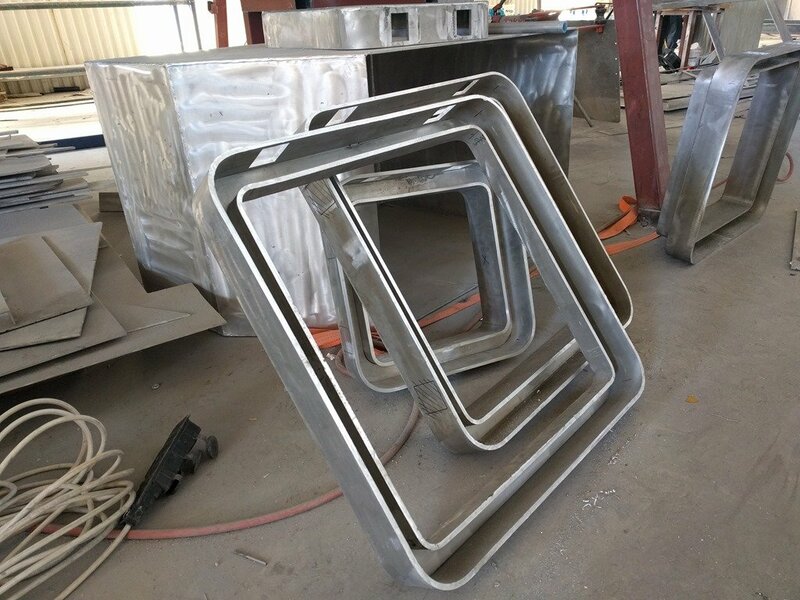 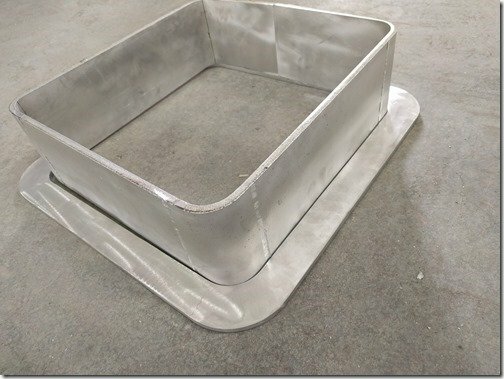 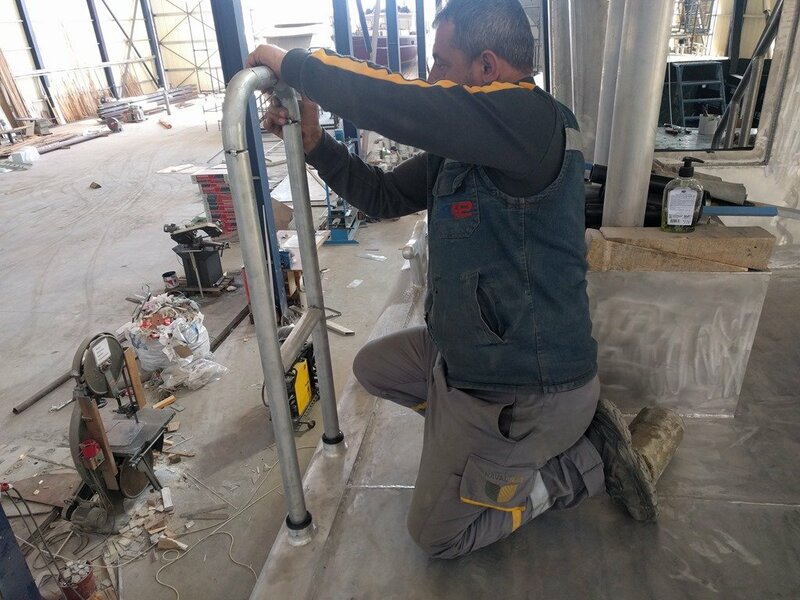 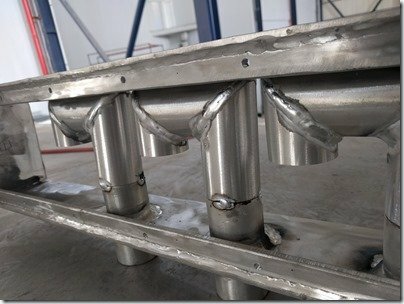 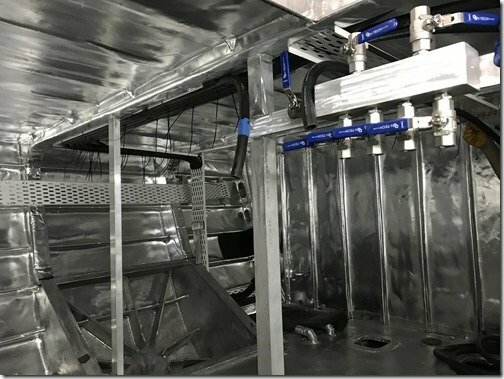 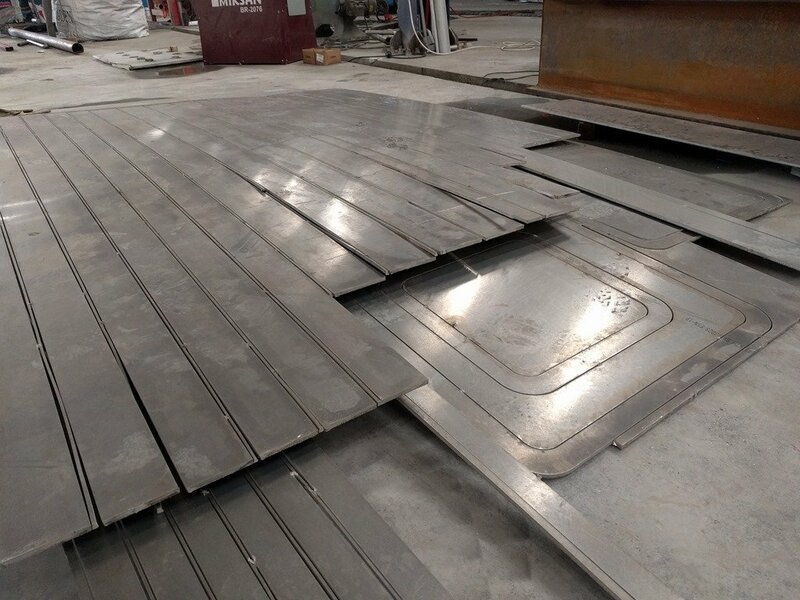 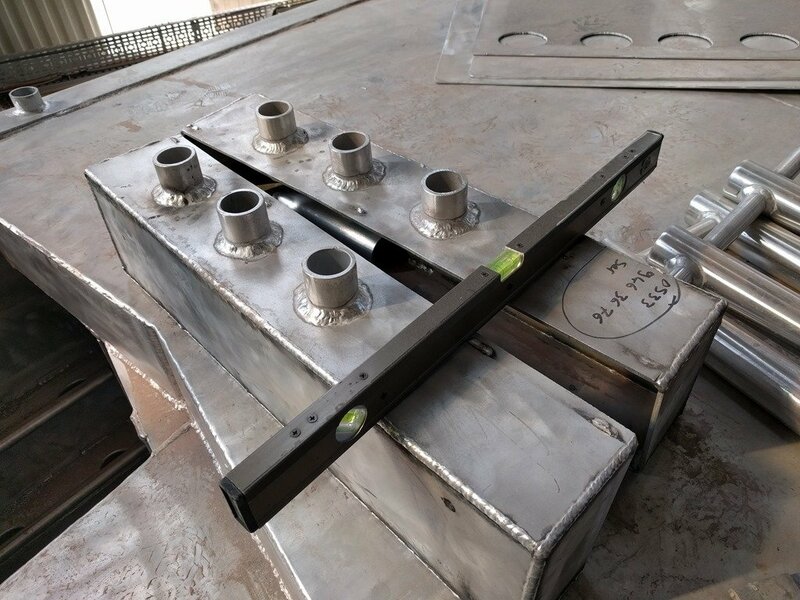 This design keeps our side decks clear, provides for easy to reach fueling stations, eliminates the chance of rain or sea water getting into the tanks and most importantly contains any spillage in the wide deep tray surrounding the fill pipes. 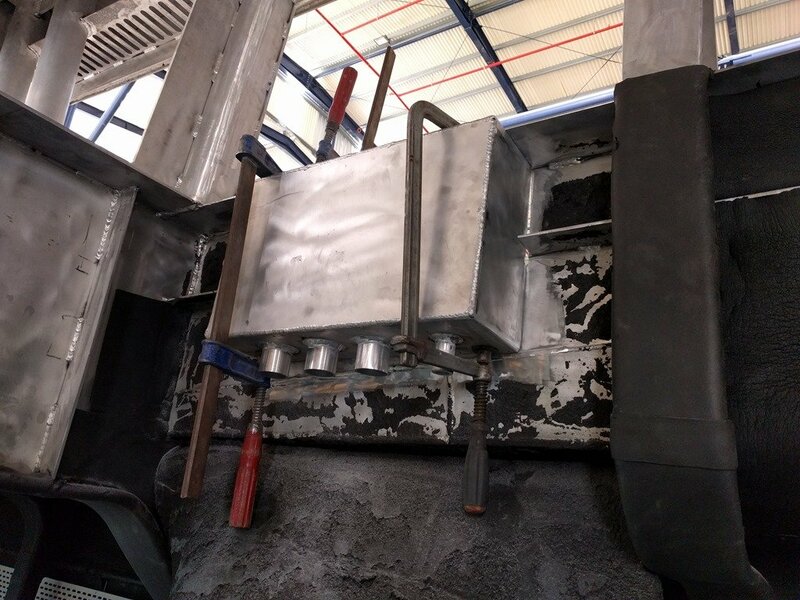 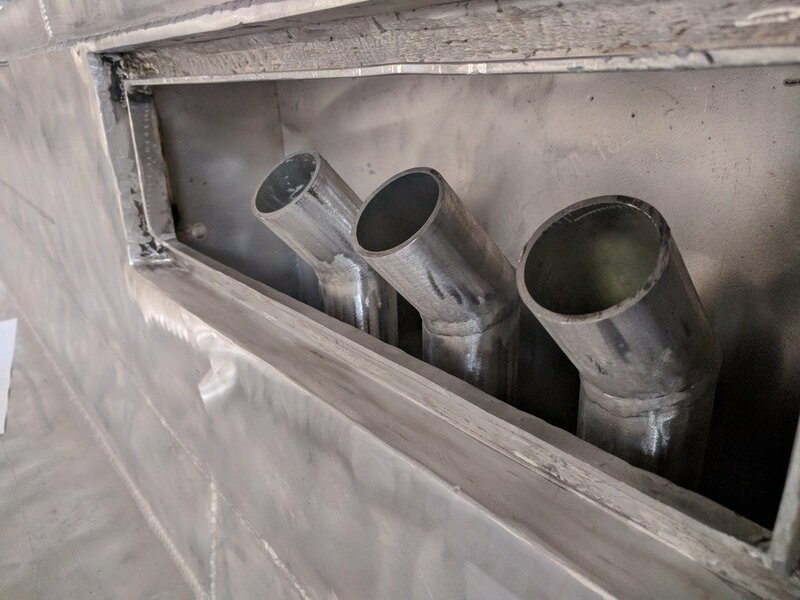 Each of these Fuel Fill boxes could hold as much as 15 litres, but if you look at the bottom of the Fuel Fill box above you will note the smaller pipe on the right side in that photo which is a drain line that returns any spilled fuel to the tanks. 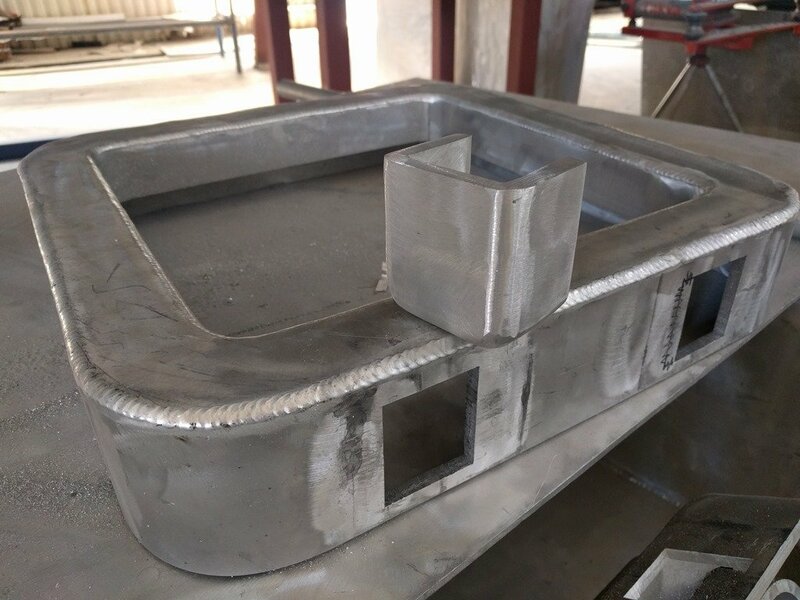 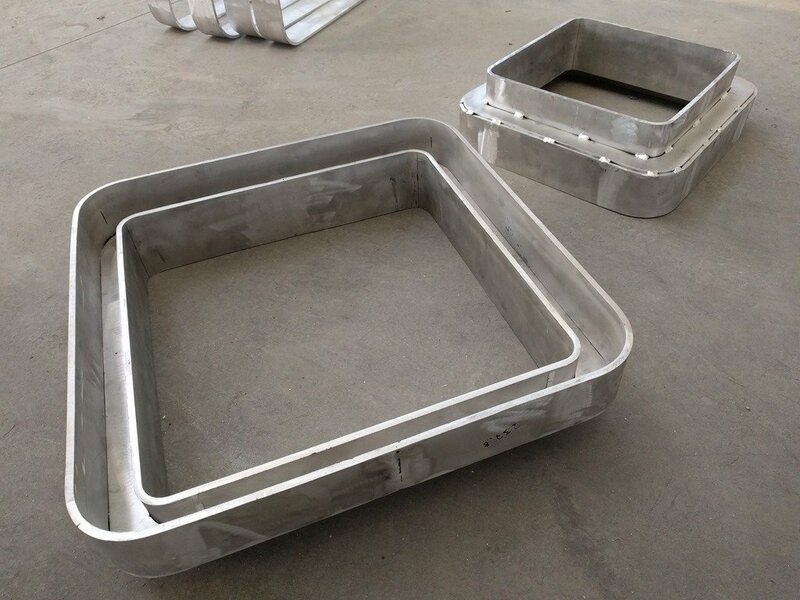 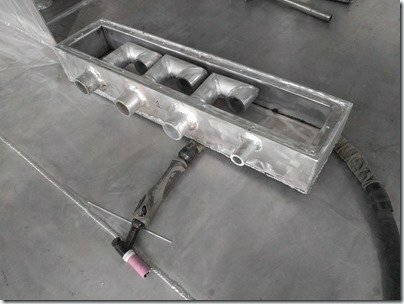 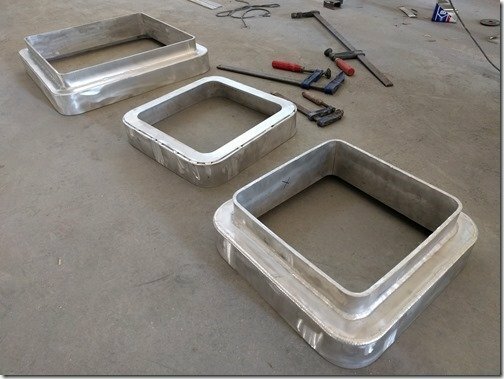 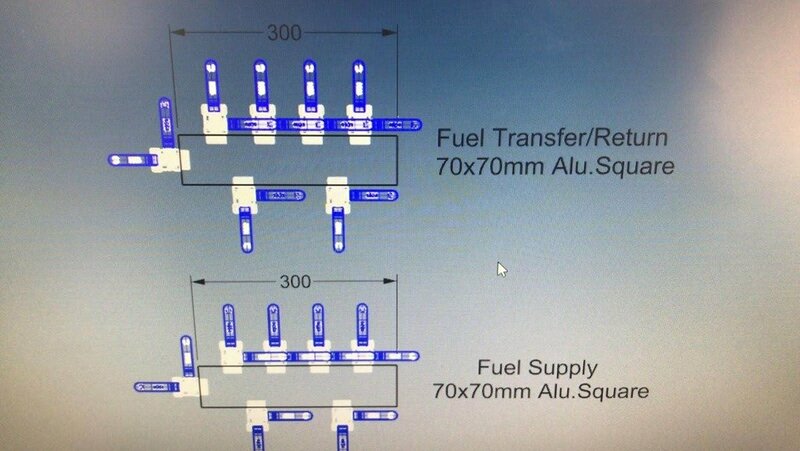 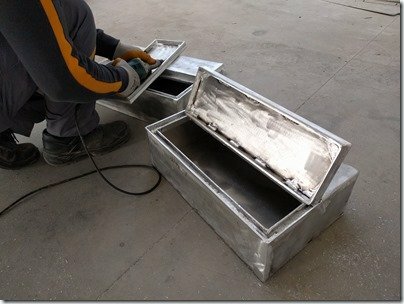 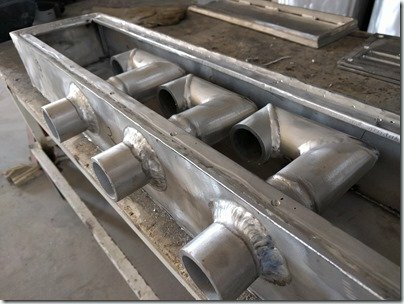 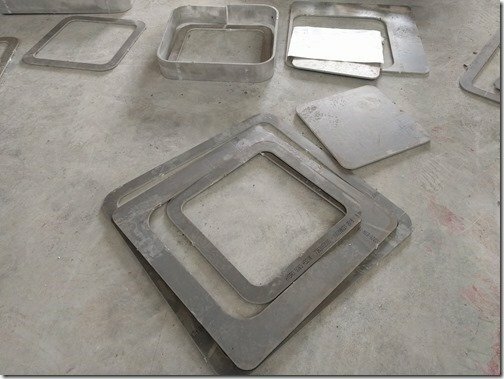 Forward of each Fuel Fill box these two Fuel Vent boxes will soon be welded in place. 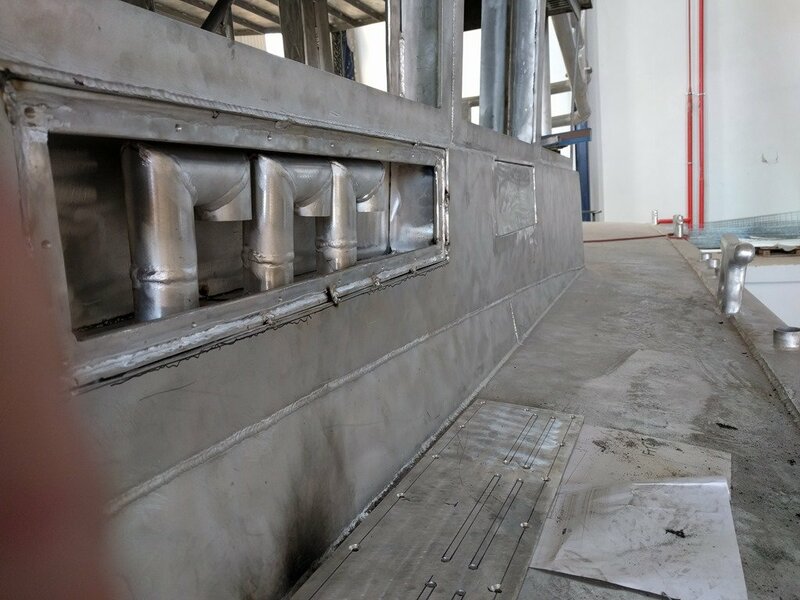 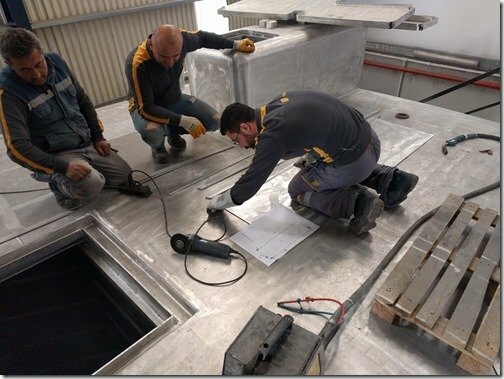 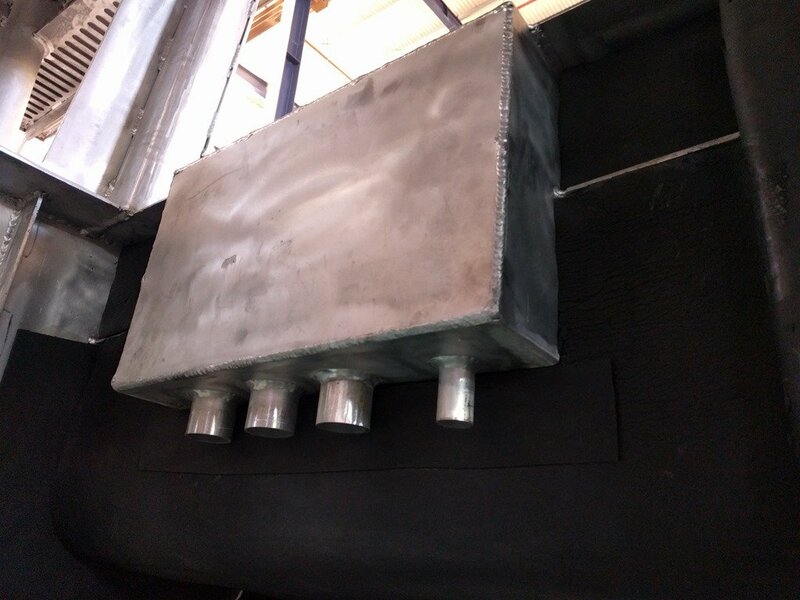 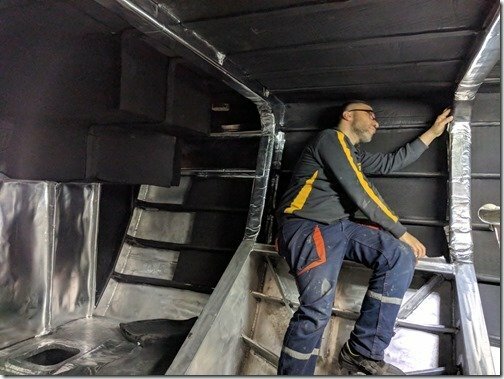 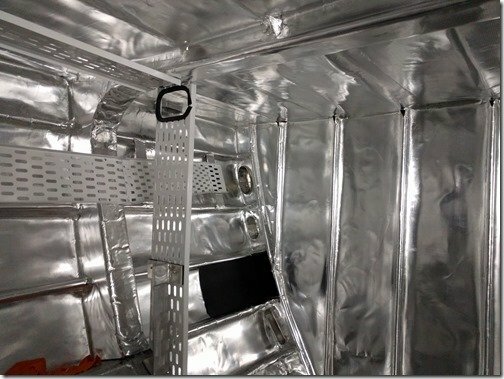 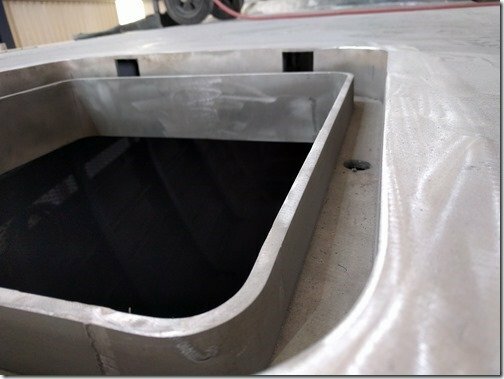 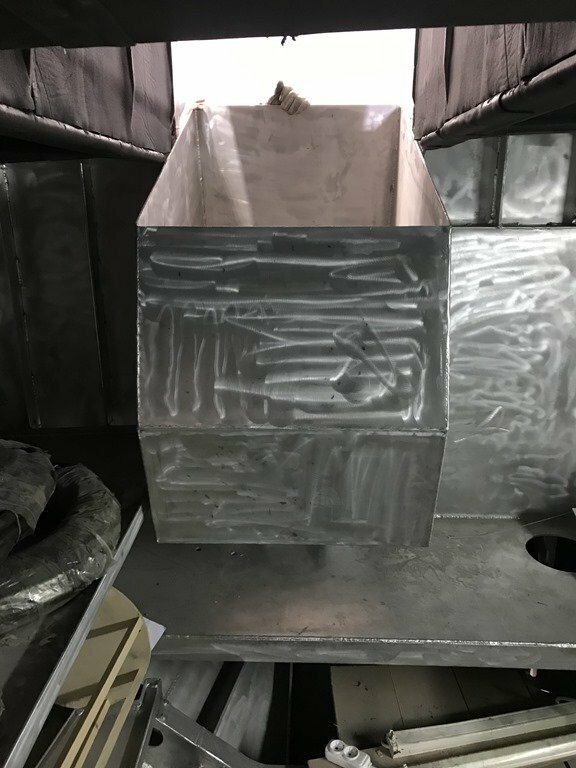 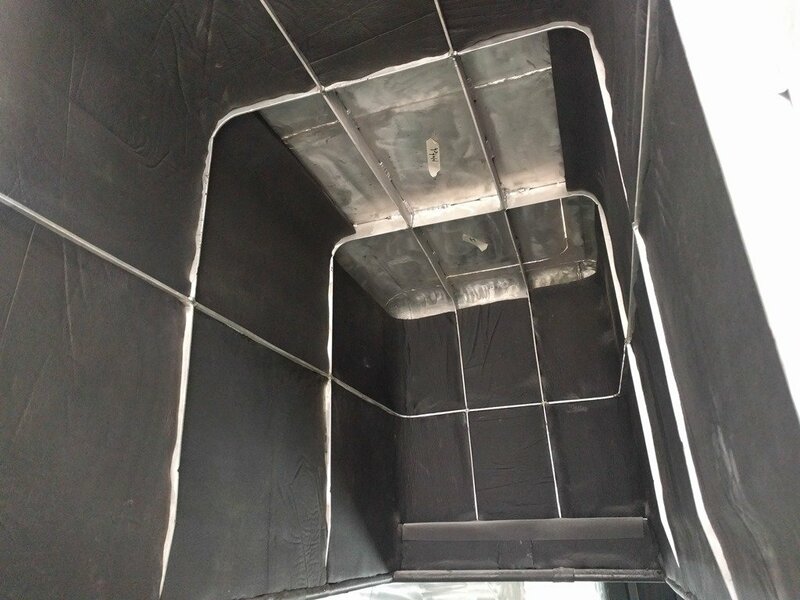 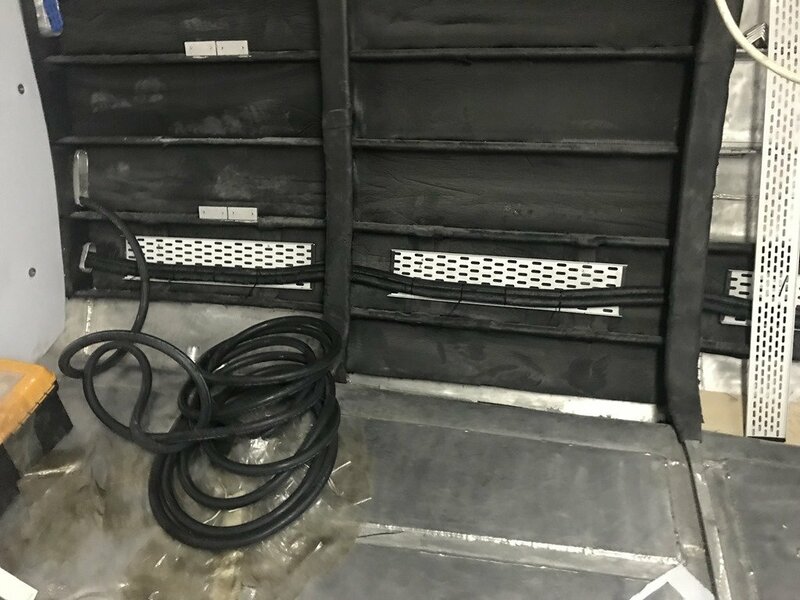 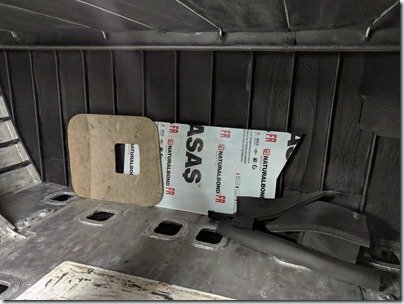 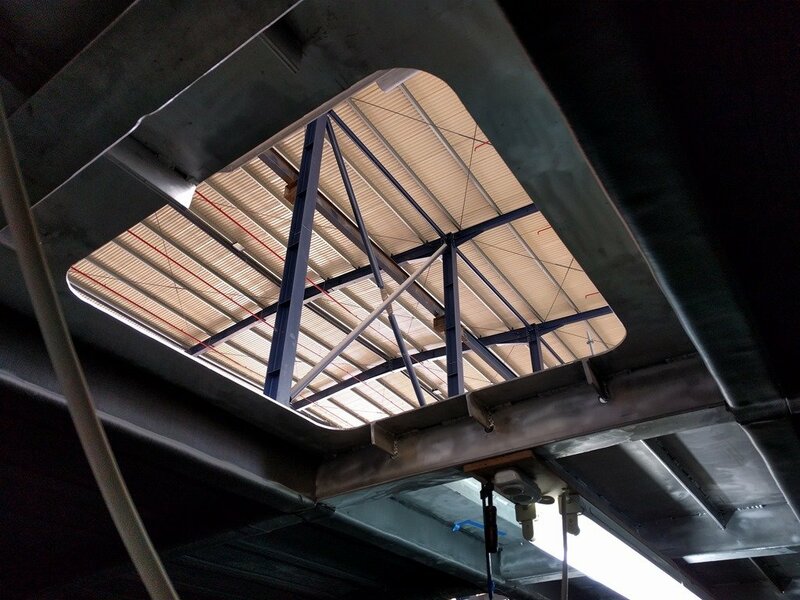 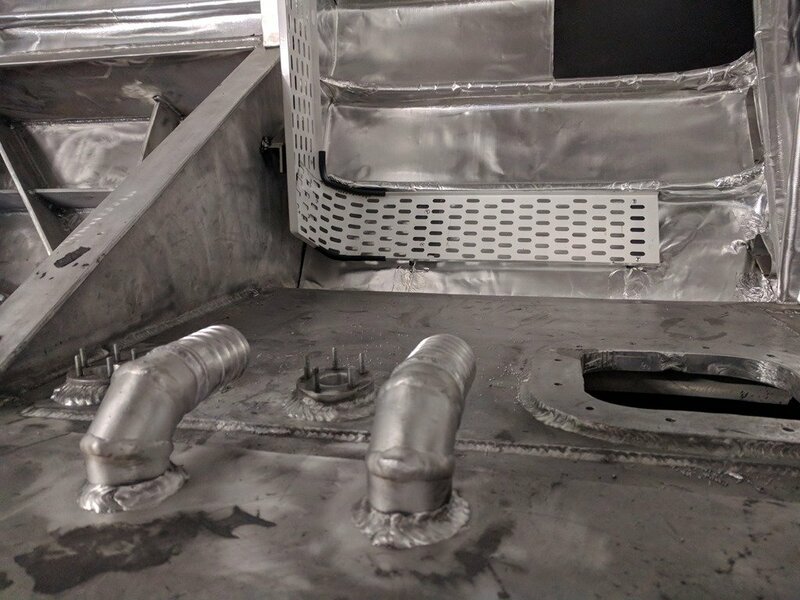 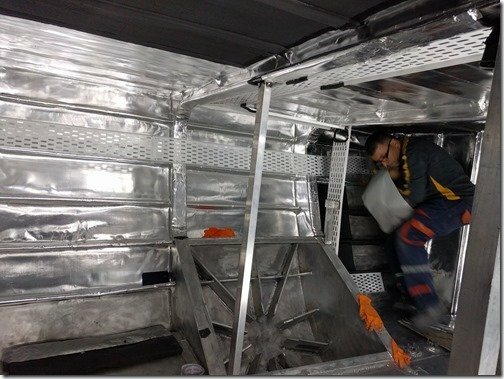 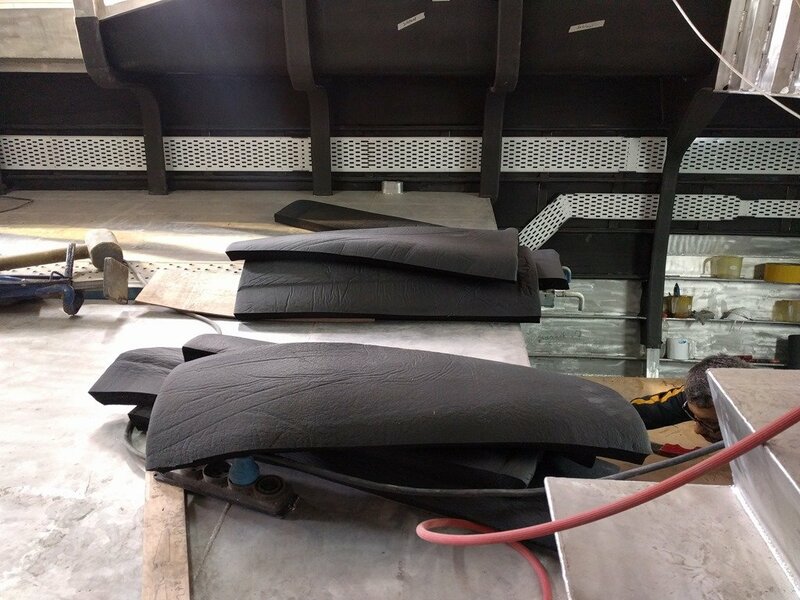 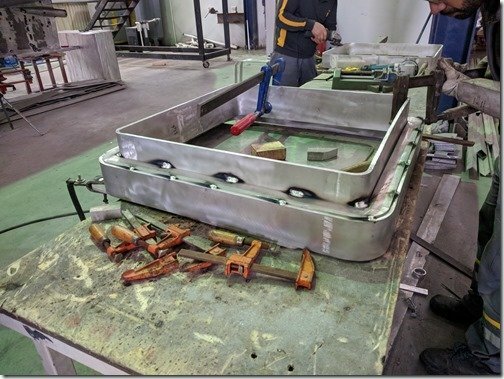 These Vent Boxes will have a demister grill on the upper half where they attach the the PH coaming so that they too can capture any fuel foam that might make it all the way up here. 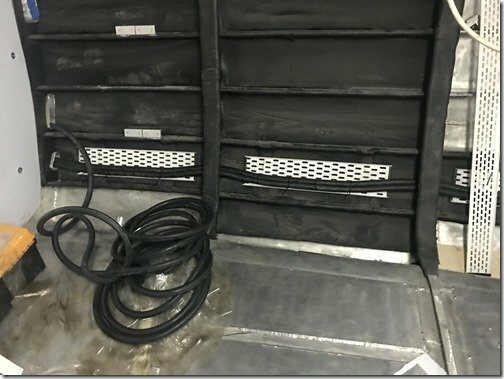 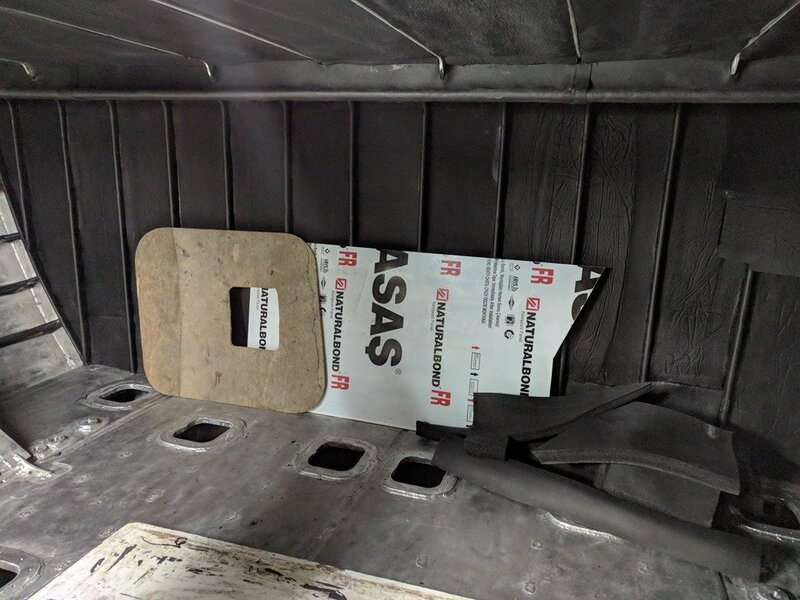 As with the Fuel Fill boxes these Vent boxes contain any such spills within and will have a similar drain pipe back down into the fuel tanks. 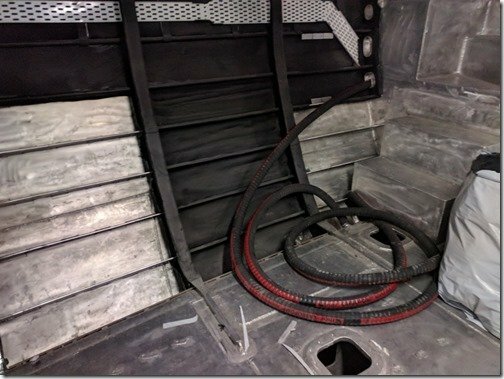 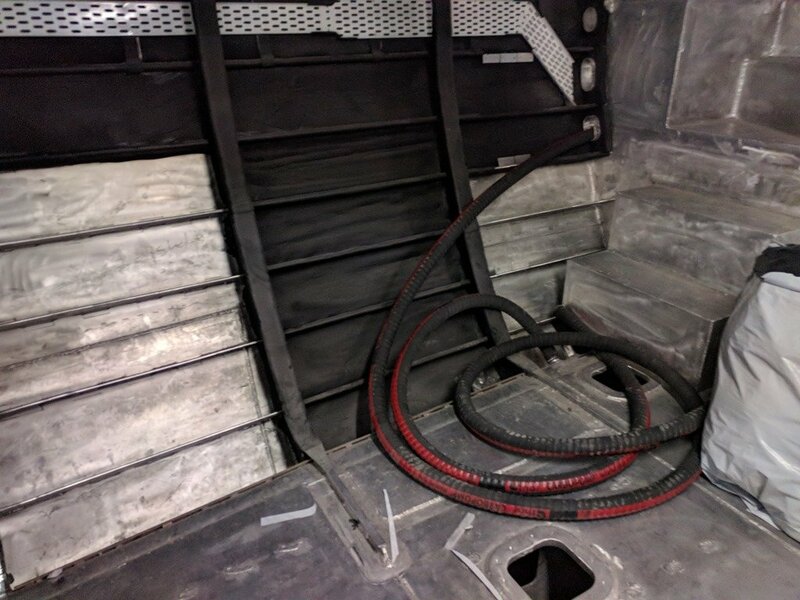 Large diesel bunkering hoses don’t have the same kind of automatic shut offs you are used to when filling up a vehicle at the gas station. Instead you are alerted to the tanks being full by listening carefully to the change in tone of the air coming out of the tank vent lines. 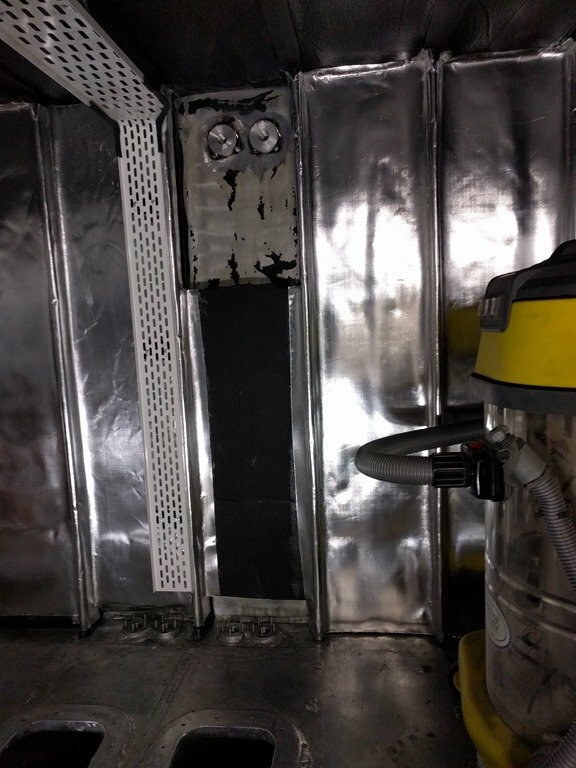 By locating all the fuel vents right beside the fills makes it very easy to hear this sound and makes it relatively easy to gauge when the tanks are full with plenty of time to shut off the flow from the nozzle and avoid any spillage. 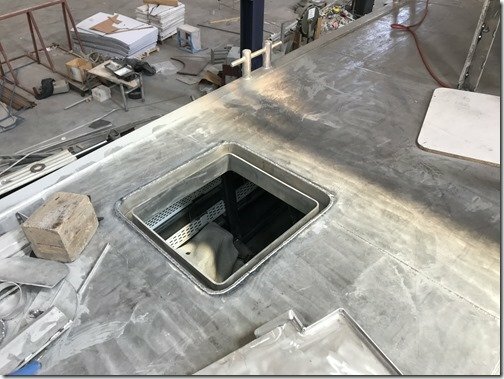 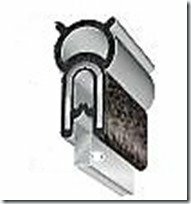 The other nice feature of this Vent Box design is that when we leave the boat for longer periods of time to fly back to visit grandkids, family and friends, we replace the demister grills with sealed AL plates that bolt in their place and prevent any humid air circulation getting into the fuel tanks and eliminating any condensation that might be created. 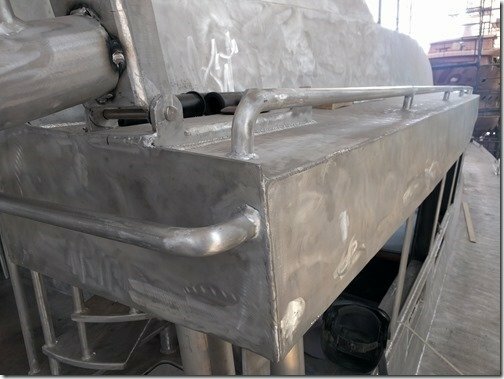 Our Alfa Laval MIB303 centrifuge can easily remove every bit of water or other contaminants that might find their way into our fuel tanks but we would rather prevent water from getting into our fuel in the first place, and leave the Alfa Laval to cleaning up the contaminants we can’t so easily control. 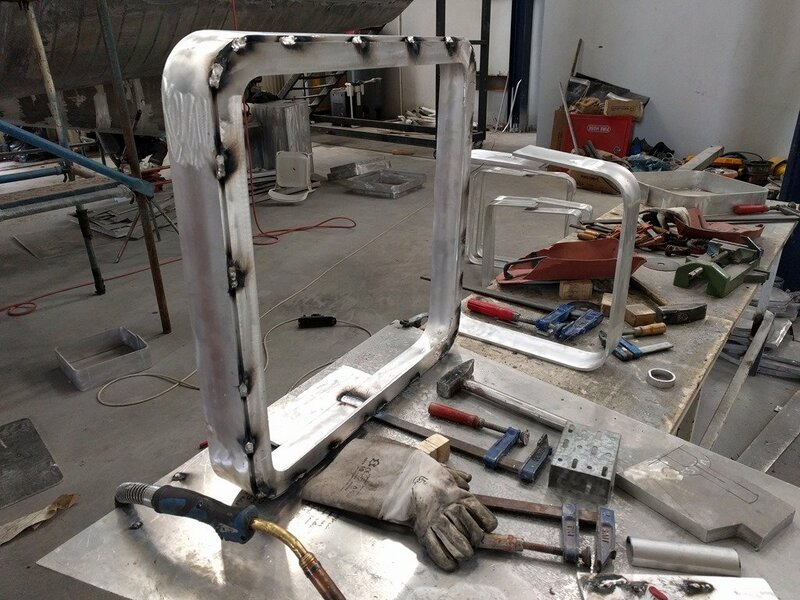 When you are full time live aboards and spend most of your time in Xtremely remote parts of the world this kind of “belts and suspenders” thinking and designing is critical and becomes second nature. 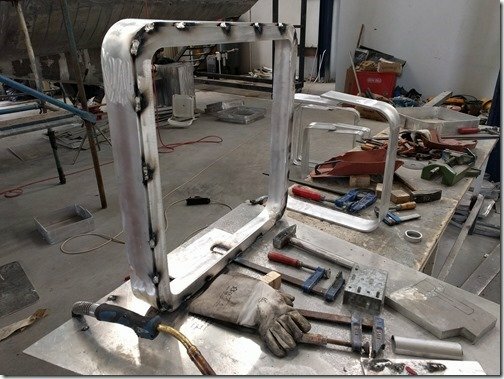 These are just the latest examples of what we are appreciating and enjoying more and more about our “collaborative work of art and engineering” approach where we get to apply all our experiential learning and create the just right, just for us Goldilocks boat and home thanks the talents and skills of Dennis at Artnautica and the whole Team Möbius that Naval Yachts has assembled and included us within. 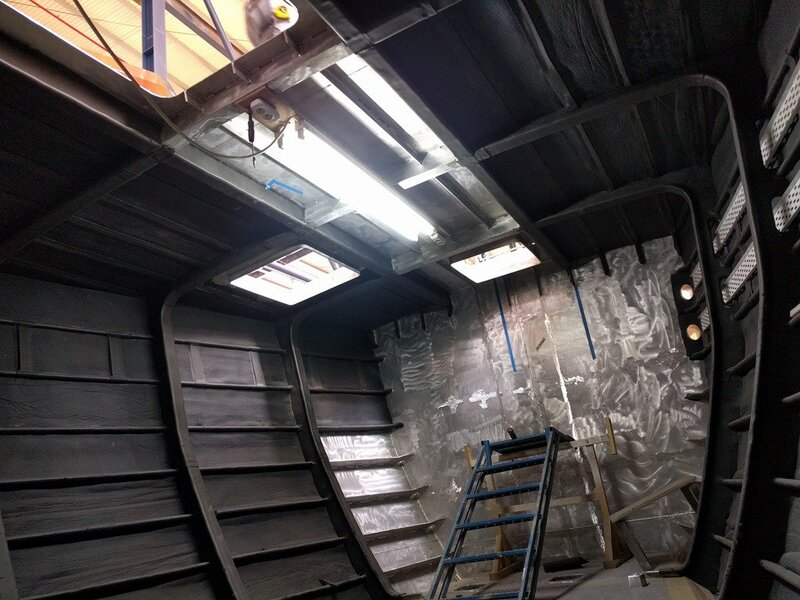 And that pretty much wraps up this week’s progress report. 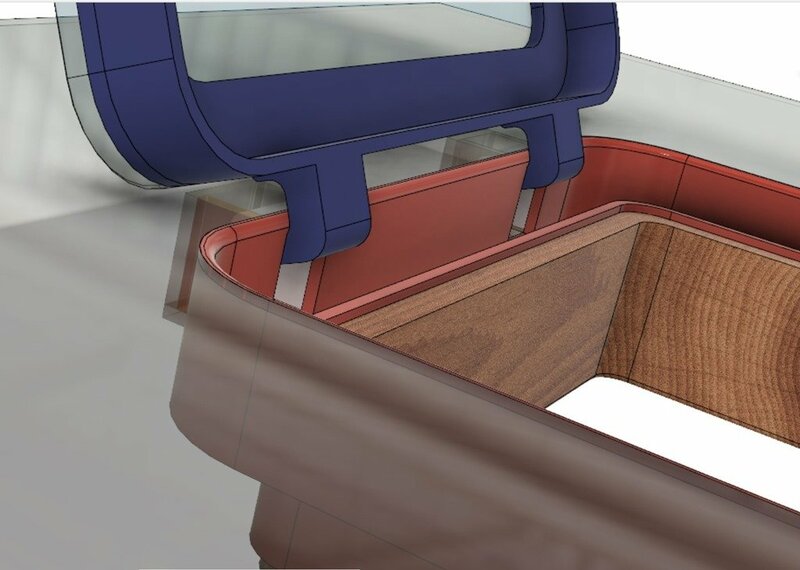 In addition to what you’ve seen above we have also been busy this week finalizing the design of the hatches we will soon start building, working out more of the details for the interior design of all the living spaces, choosing woods, fabrics, ceiling and wall coverings and we will show you more about all that in the updates to follow. 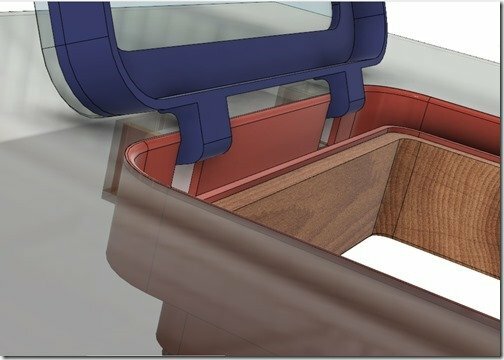 We would be most appreciative of your comments, questions and suggestions you can add in the “Join the Discussion” box below. 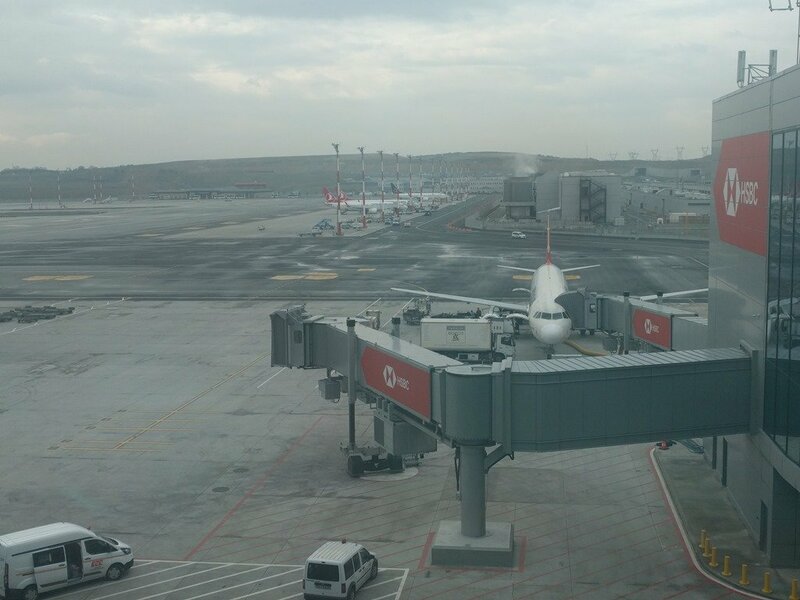 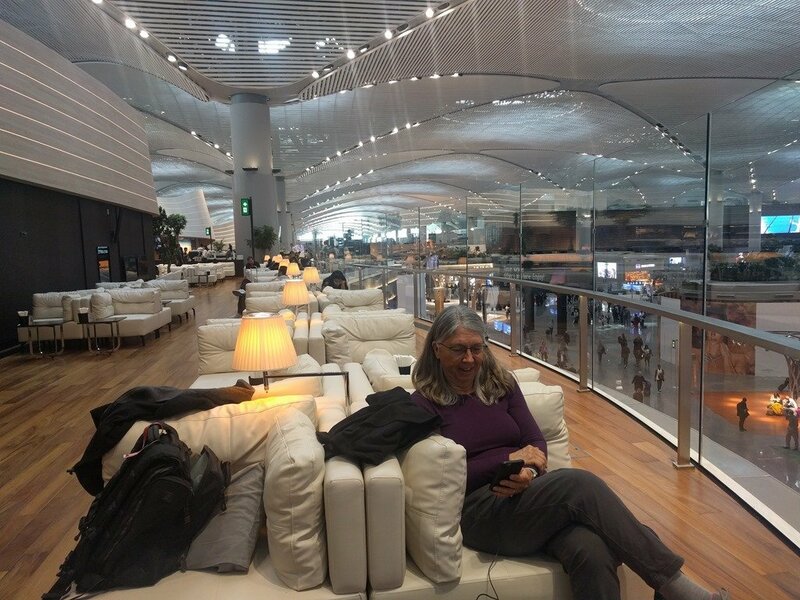 See you again next week and thanks for taking the time to join us here.